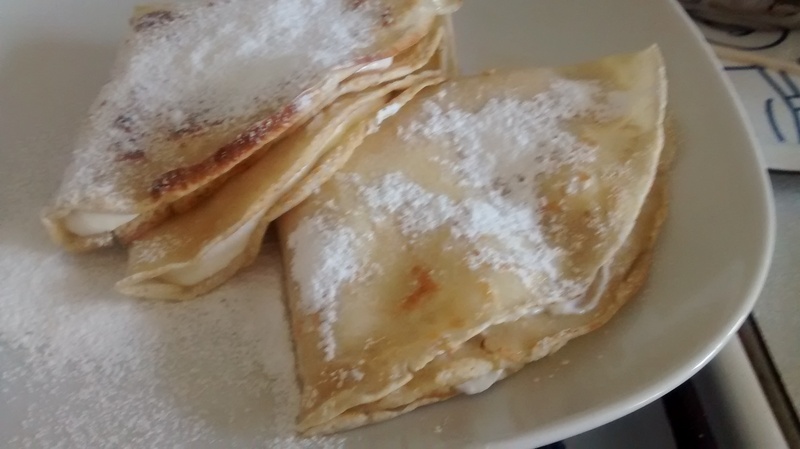 Naleśniki are thin pancakes like the French crêpes. 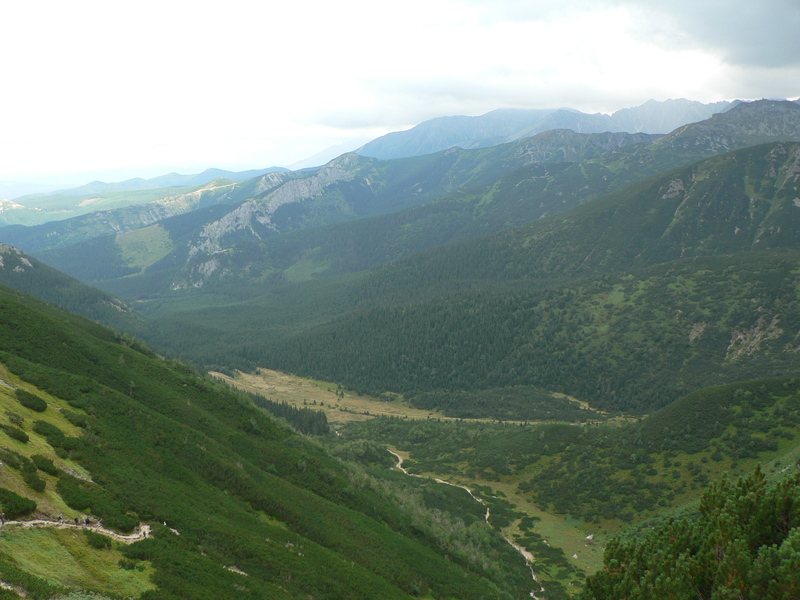 Their name comes from the Polish verb to pour. 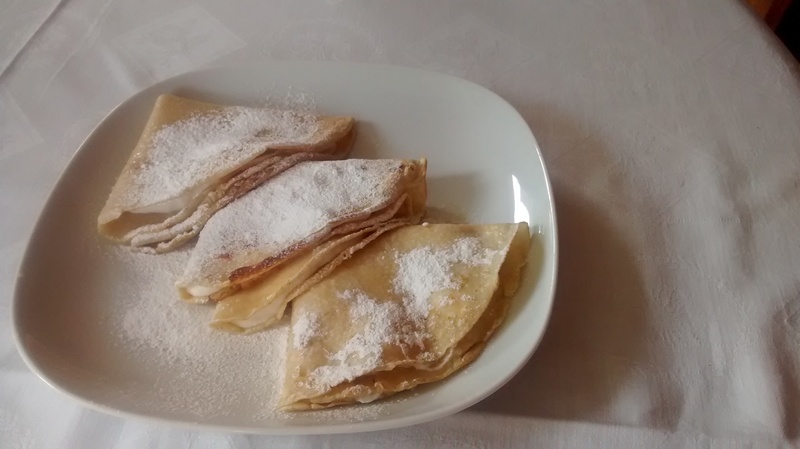 In Poland pancakes are eaten all year round, with either savoury or sweet fillings, and not just before Lent. (In fact pancakes are not amongst the special foods eaten before this time of fasting). We used to have then about once a week but I never seemed to have been involved much in their making except for spreading the fillings on, so when I started to make them myself I had lots of disasters! 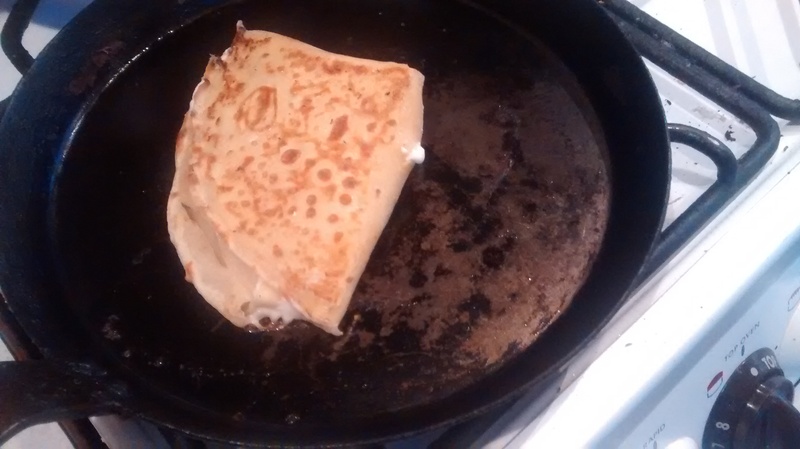 My pancakes were always a bit hit and miss. Often the constancy was not constant nor the thickness and nearly always the first one of the batch would stick to the pan and have to be thrown away. 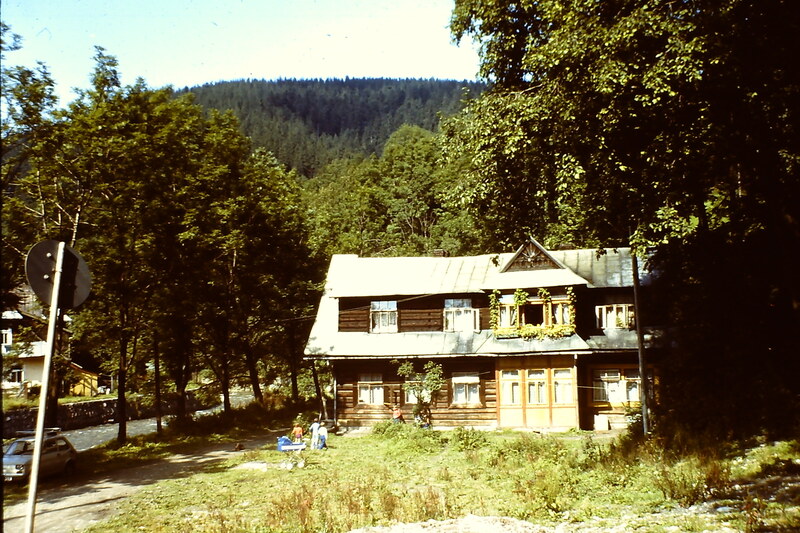 Then I looked up the recipe in my old Polish cookbook, made a few telephone calls to various relatives and also followed Delia Smith’s advice and bought a special frying pan which I use only for pancakes. So I now I think I know the secrets of making perfect pancakes and these I will now pass on. 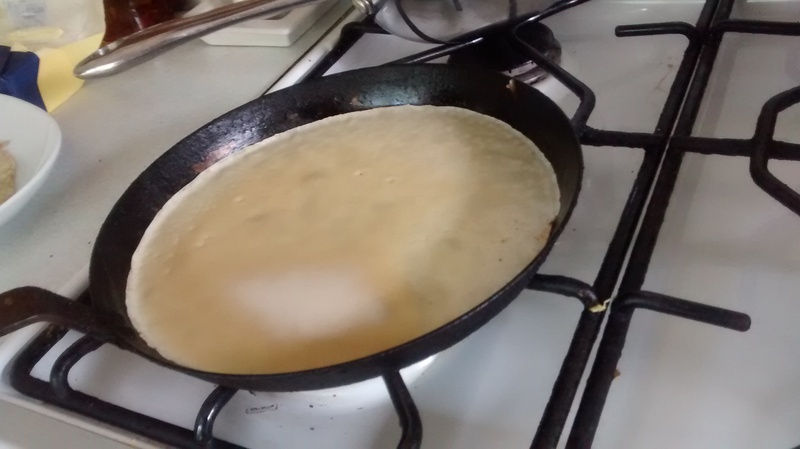 You must use a mixture of milk and water – 50/50 is the best – this ensures that the pancakes do not burn as easily and also enables you to make then very thin and elastic so they are easy to work with. (This is the most important tip). Beat the eggs and add then them first to the sifted flour. 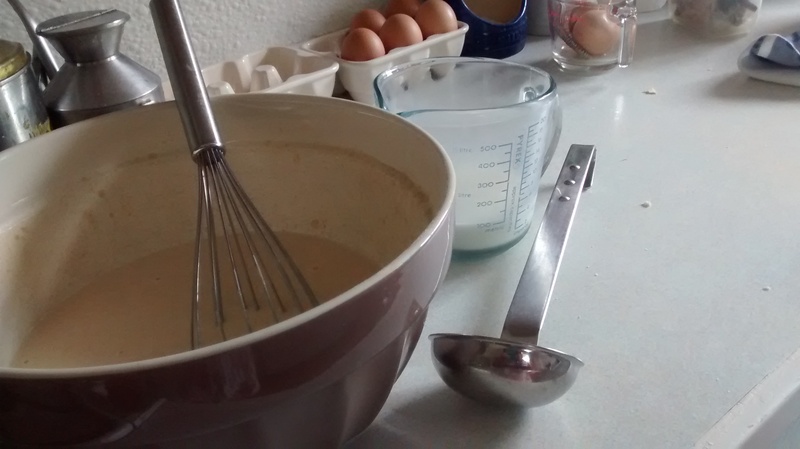 Add the milk mixture to the egg and flour mix until you have a batter the consistency of pouring cream. 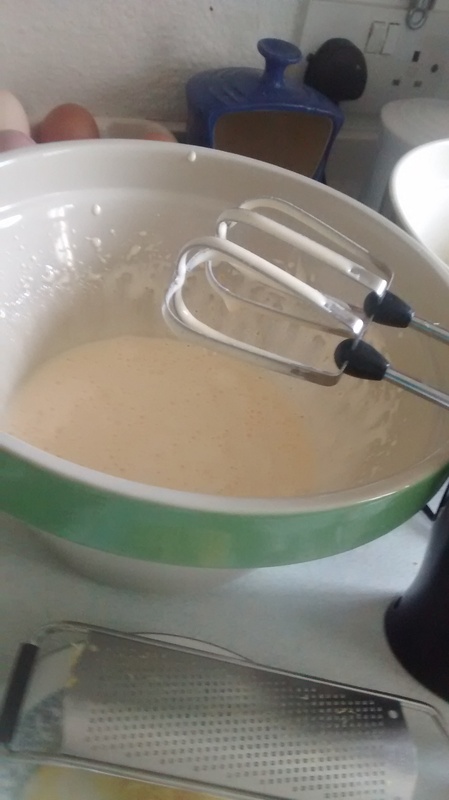 Leave the batter to stand for at least 1 hour in which time it will thicken, then add a little more liquid. 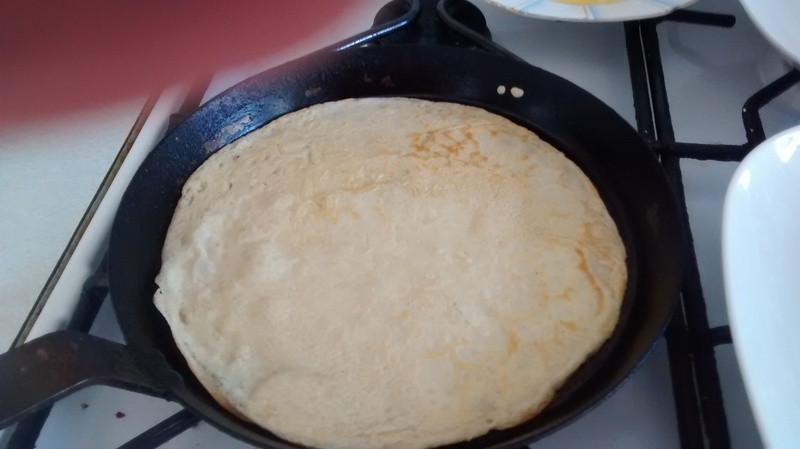 Use a special thin pan which you use just for pancakes, mine has a base diameter of 20 cm and is made of steel, once seasoned, just wipe it clean between uses with kitchen roll – never scour it or use detergent. 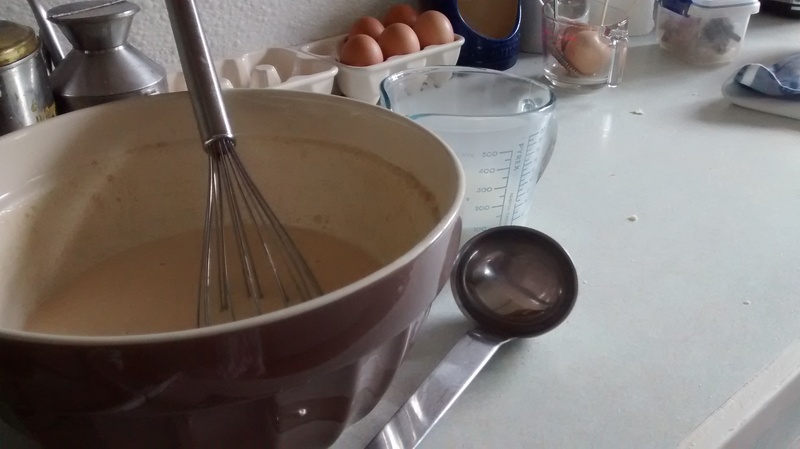 Work out how much batter you need for a pancake and find a measure which will then give you a consistent amount – I use a small ladle which holds 45ml. Have a dish of melted butter or margarine and sunflower oil for frying so you can add just enough and tip some back if needed. This amount makes around 8 pancakes. 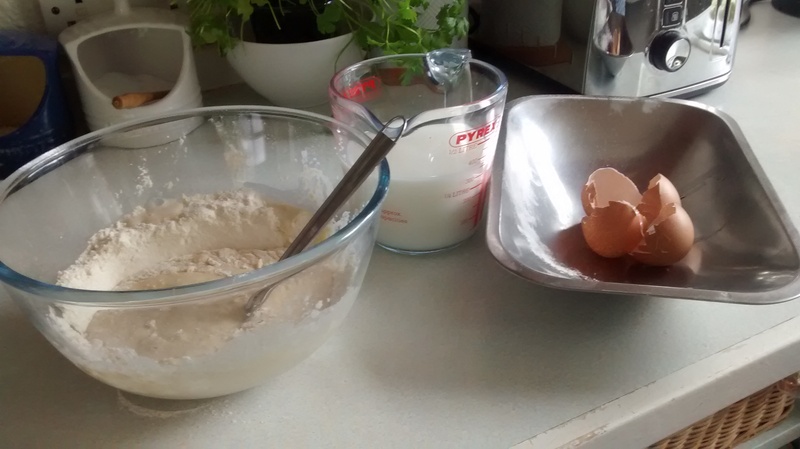 I remember this recipe as it is all the 2’s for ease, but it will depend on the flour and the size of the eggs, you might not use all the milk & water mixture or you might just need a little more. Heat the pan – you want a high heat but not too much to burn the pancakes – you will find you have to keep adjusting the heat. (As I cook using gas this is easy to do). Using the ladle pour the mixture into the pan. 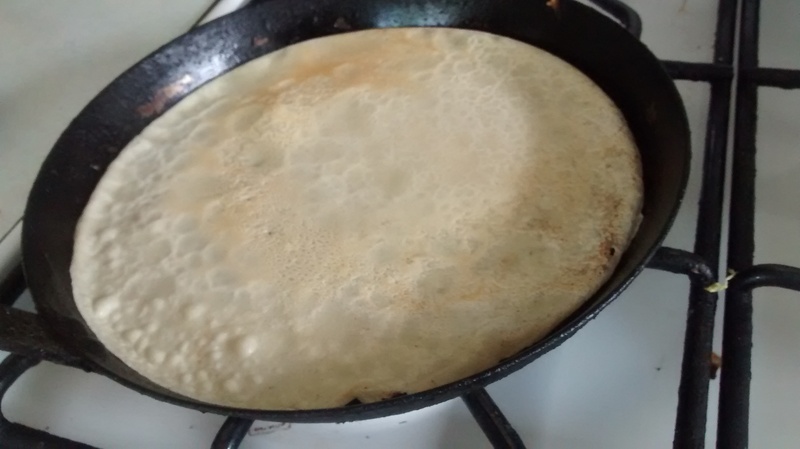 Tilt the pan so that the mixture covers the surface completely and evenly. 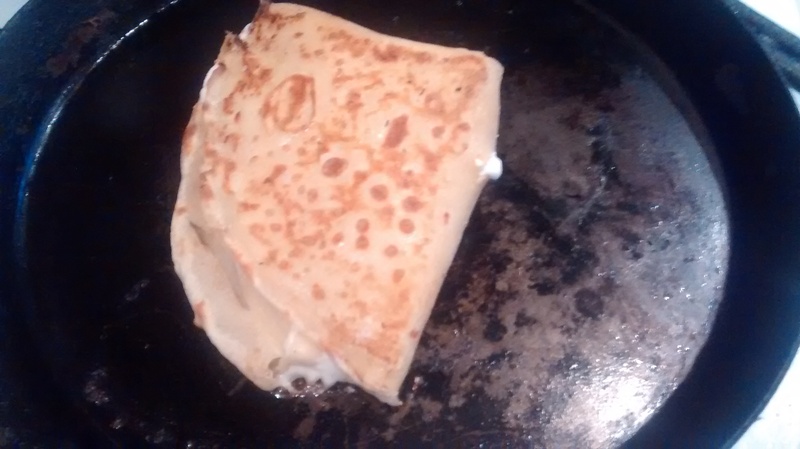 There are many recipes for pancake fillings both savoury and sweet. 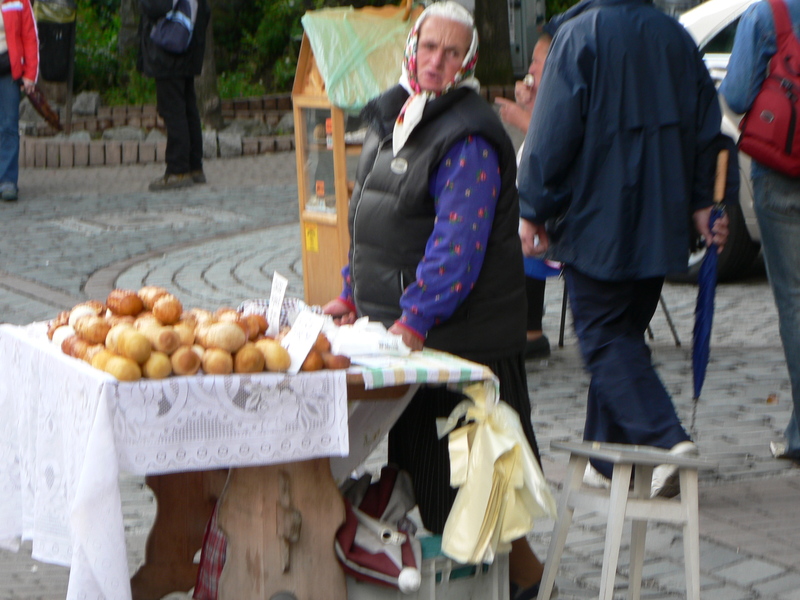 I think the 2 most popular sweet fillings in Poland are sweet curd cheese (see a previous post) and stewed apples with cinnamon. 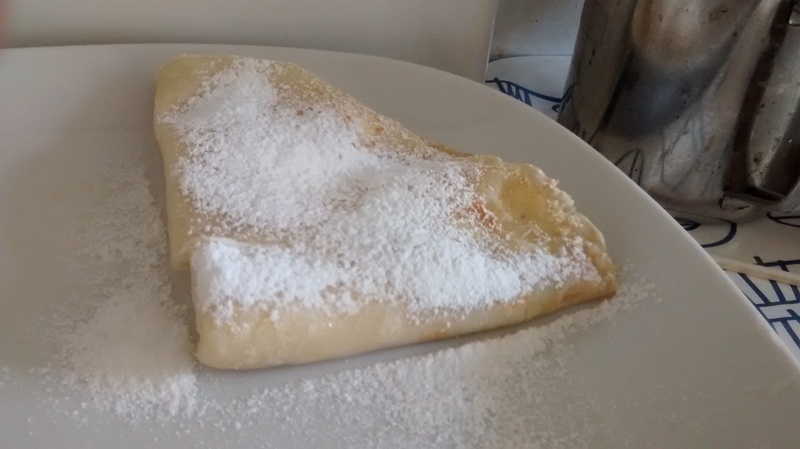 Pancakes with sweet fillings are normally folded into triangles – fan -shaped by folding the pancake into half and half again. 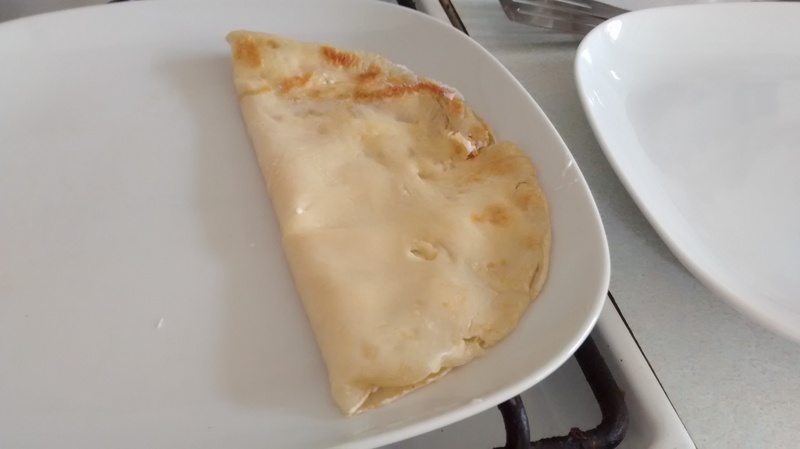 Pancakes with savoury fillings are normally rolled up and often then put in a dish, topped with a sauce or grated yellow cheese and put in the oven for a time. In these instructions I have used photographs of pancakes being made with the sweet curd cheese filling. I find two are enough for me! 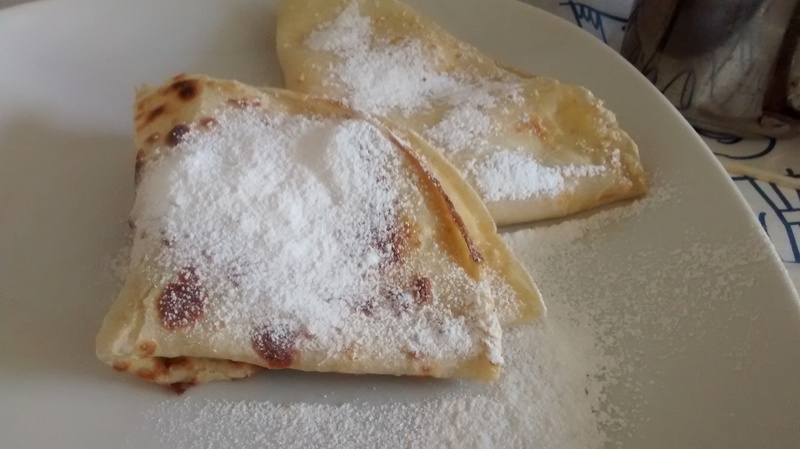 You can make the filled pancakes in advance prior to dusting them with icing sugar and then heat them up on both sides – using the pancake pan again – maybe with the addition of a little butter. Then dust them with icing sugar. This sweet fresh curd cheese mixture is one that is used as a filling for pancakes in Poland. 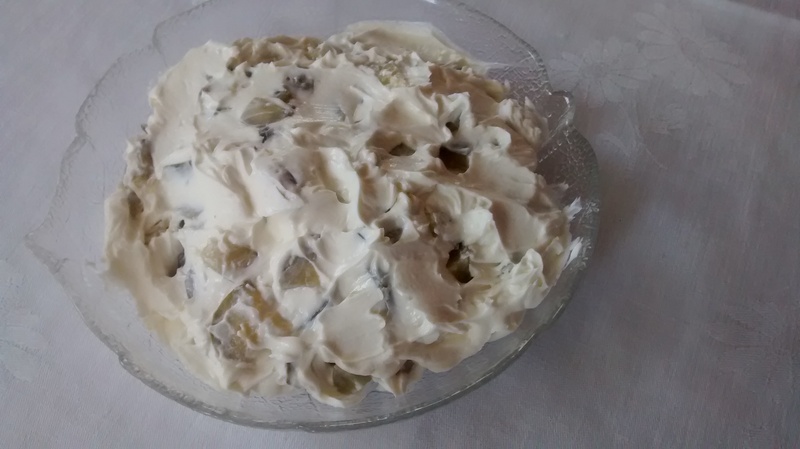 You can make this mixture with twaróg – curd cheese, cream cheese or yoghurt cheese. Use 1 packet of cheese, usually 200g – 300g , to this add 2 to 3 tablespoons of soured cream and 2 to 3 tablespoons of icing sugar and mix this together till you get a smooth mixture. You can add 2 to 3 drops of vanilla essence. Do not add too much sugar – you want the contrast of sweetness & sour. Add a spoonful or two on top of red fruits such as strawberries and raspberries which have been dusted with icing sugar. 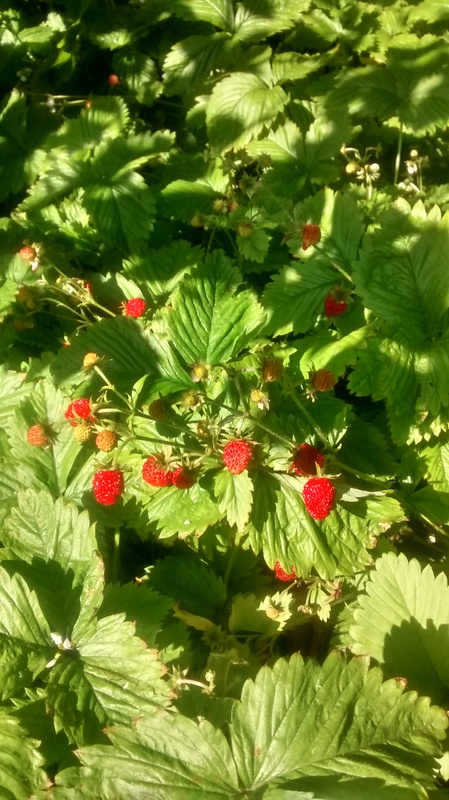 Alpine Strawberries – growing in my garden. 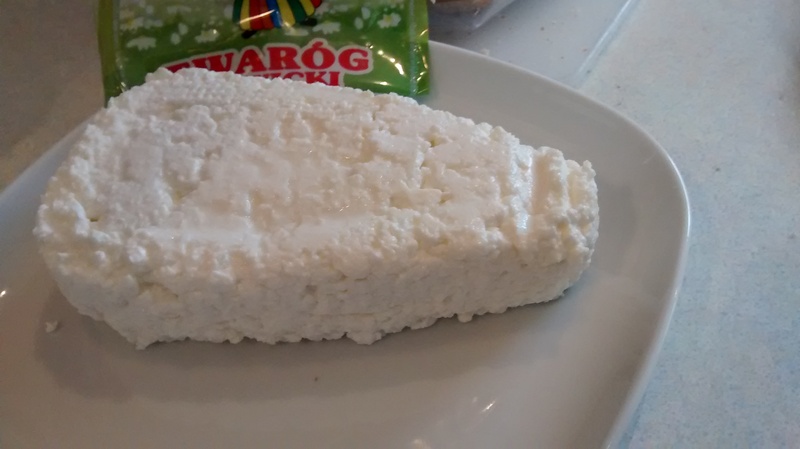 Twaróg – Polish Curd Cheese is used extensively in cooking and finds its way in many guises onto the Polish menu, especially at home, both in sweet and savoury dishes. 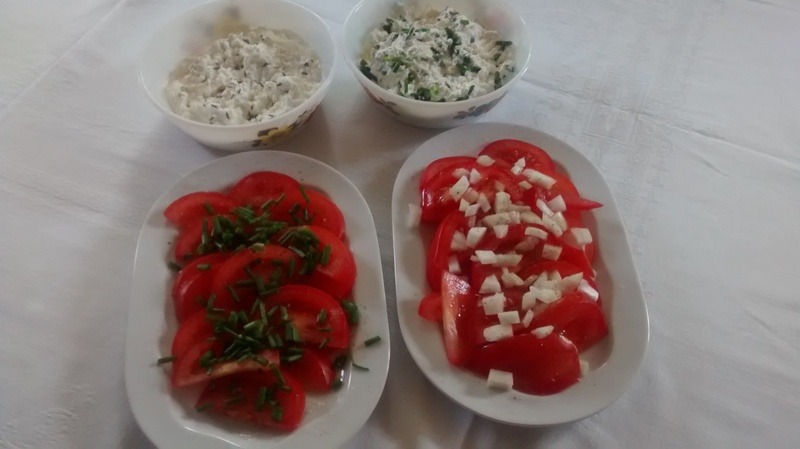 The following are what I consider to be popular classic savoury fresh cheese mixtures and are often served for breakfast with bread and salad. Here in England I think they could be served at lunchtime. 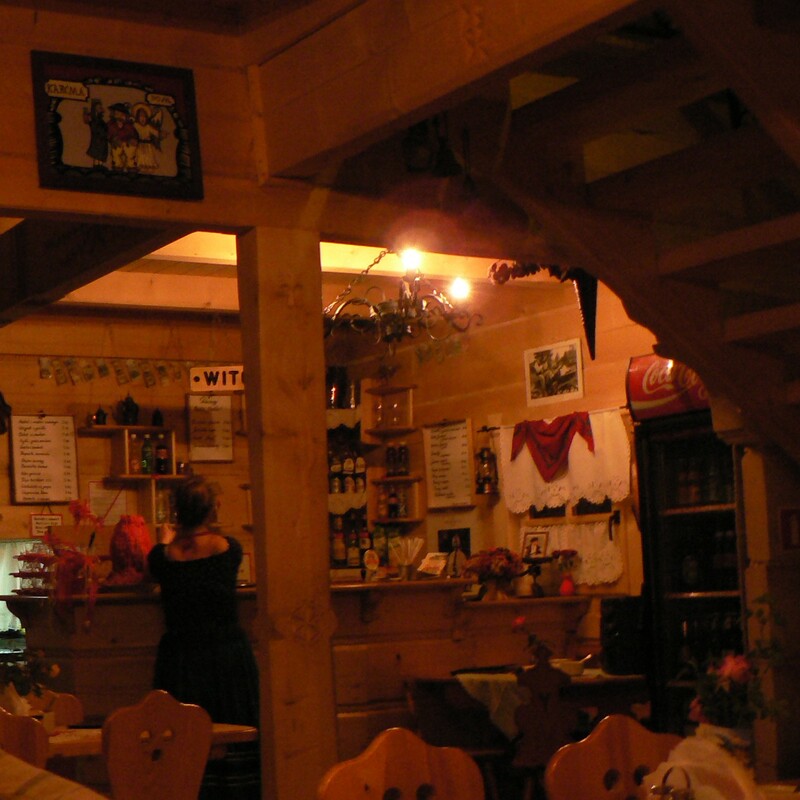 As well as with bread and rolls they can be served with crisp-breads, oatcakes or crackers. 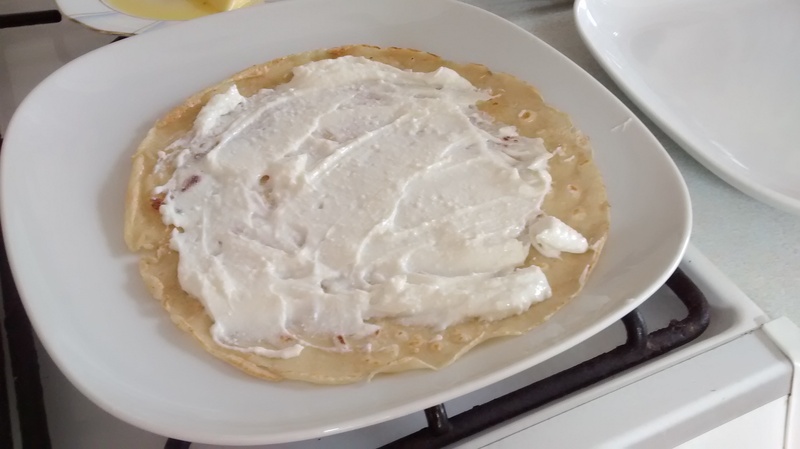 You can make these with Twaróg – Curd Cheese or with Cream Cheese. 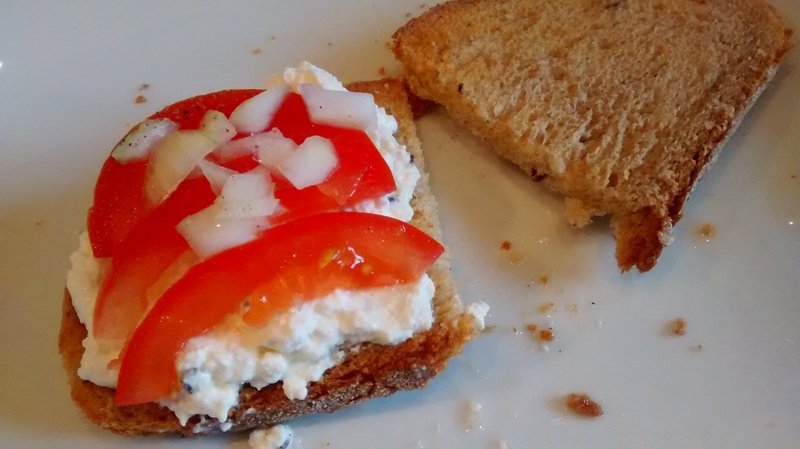 You can also use yoghurt cheese – (Look out for a post on how to make this later). The amounts used are just approximate, using one packet of cheese, which is normally around 200g – 300g, for each mixture and can be varied to taste. 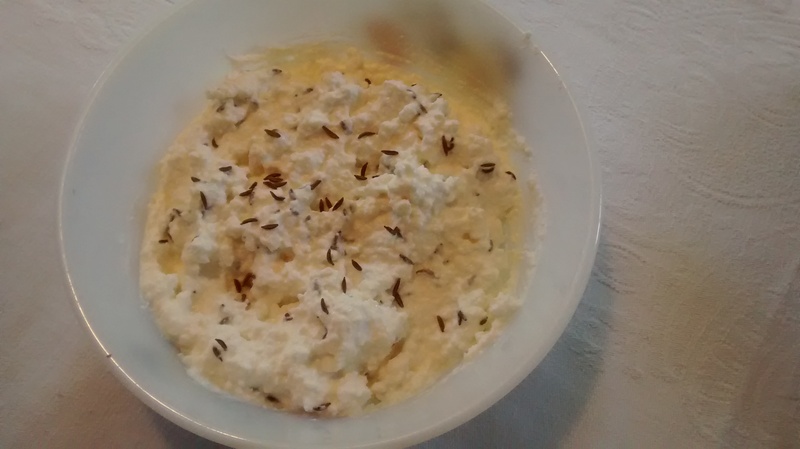 If using curd cheese, add a pinch or two of salt and a couple of spoonfuls of soured cream, mix together until smooth. If using cream cheese just take it out of the packet and mix it in a bowl – you can add a spoonful or two of soured cream to make it a softer consistency if you wish. 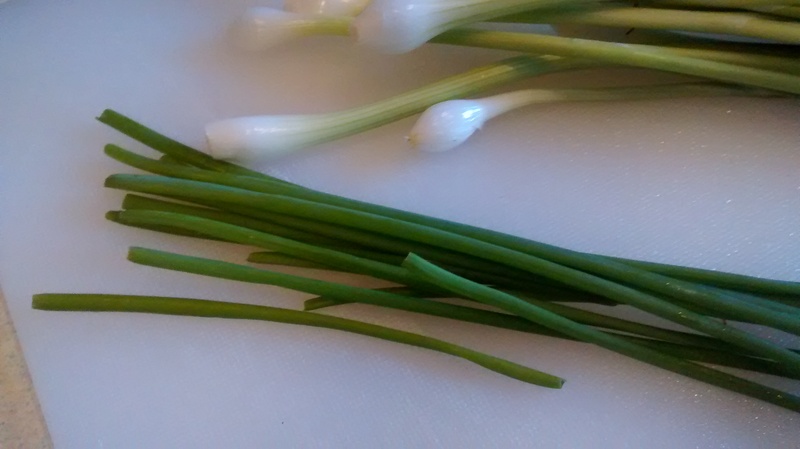 To the cheese add a few tablespoons of finely chopped chives or the green parts of spring onions. 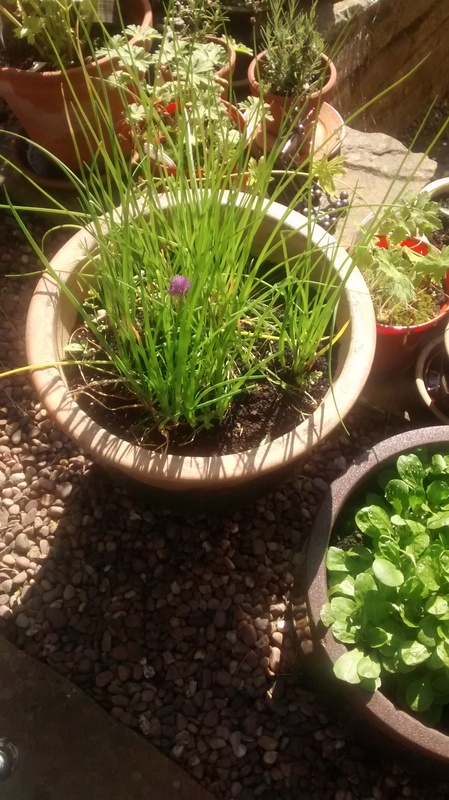 In Poland szczypiorek (which in dictionaries is given as chives) would be used – however I think it is slightly different and is much larger than the chives I grow here in England. 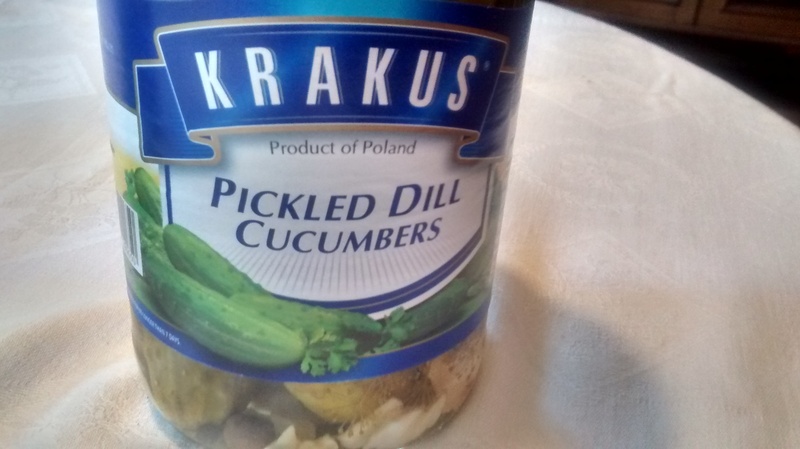 I find these are the best gherkins to use as they are not vinegary. These cheese mixtures can also be served with bliny -little buckwheat pancakes. (Look out for a a post on how to make these later). 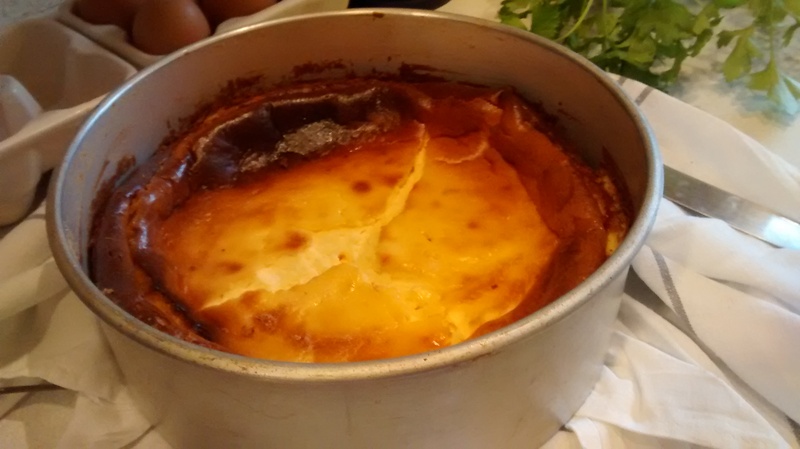 Baked cheesecakes have a very long history with the Ancient Greeks baking them with cheese and then the Romans adding eggs to the recipes. Varieties of cheesecakes were made in the Middle East and mentioned in the Old Testament. Maybe a land flowing with milk and honey is so good as these are ingredients needed to make a cheesecake! 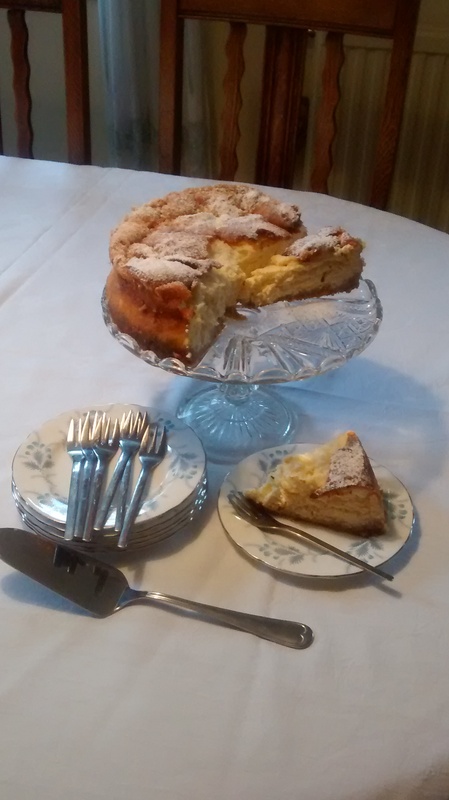 The traditional cheesecake in Poland is a baked cheesecake and it is found in Christian and Jewish Traditions. 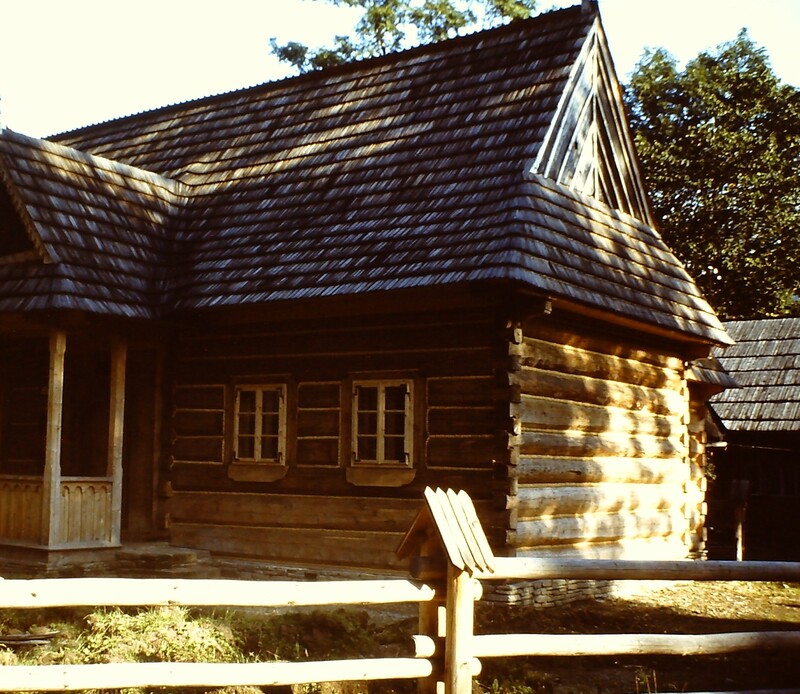 One story is that King Jan III Sobieski brought the recipe back with him after his victory against the Turks at the Battle of Vienna (1683). This could tie up with the fact that one version of the cheesecake in Poland is called Viennese – Style. 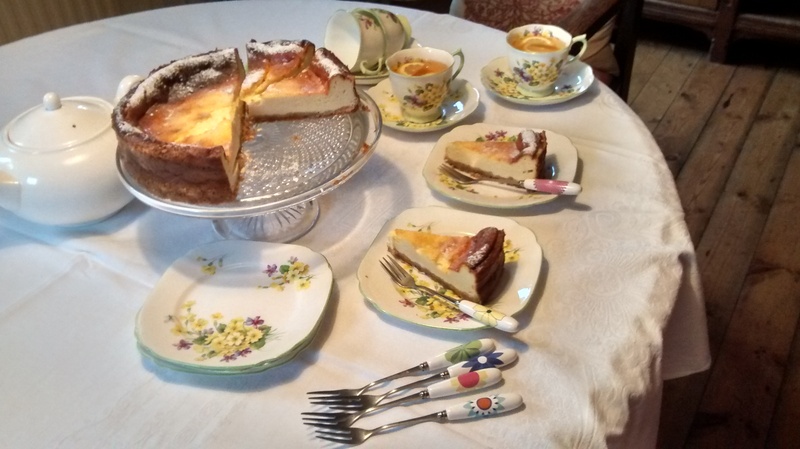 When immigrants to the United States of America from Poland, Russia and Germany took their recipes with them in the 19 Century we eventually got the New York Cheesecake. 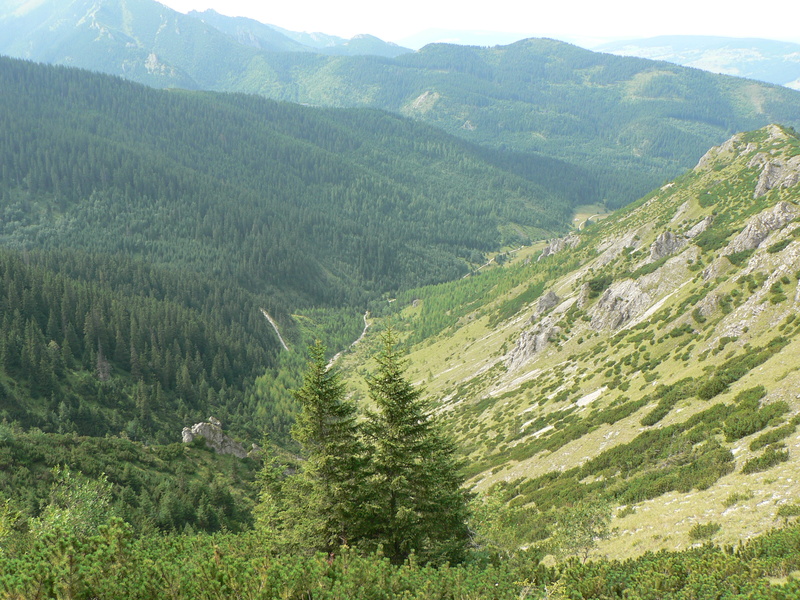 As ser is the Polish word for cheese – we get sernik as the Polish word for cheesecake. 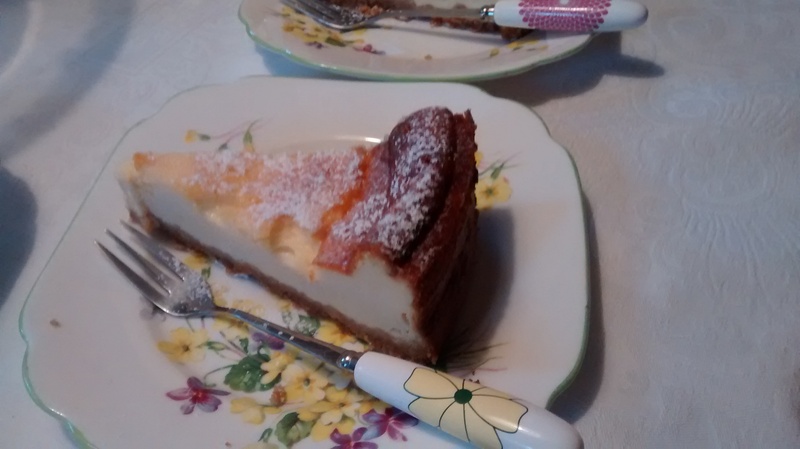 Cheesecakes are made from twaróg – curd cheese, eggs and sugar and how they turn out depends not only on the proportions of each but also the cheese that is used. Butter and soured cream may also be used. 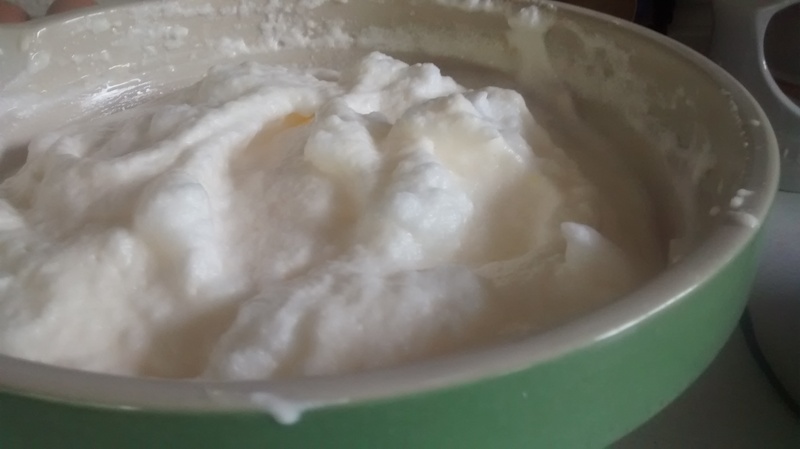 My mother used to make her own curd cheese from fresh farm milk that was allowed to sour and then the solid curds were separated from the whey by pouring the soured milk into a muslin cloth and leaving this to drain. Unfortunately you cannot make soured milk from pasteurised milk. 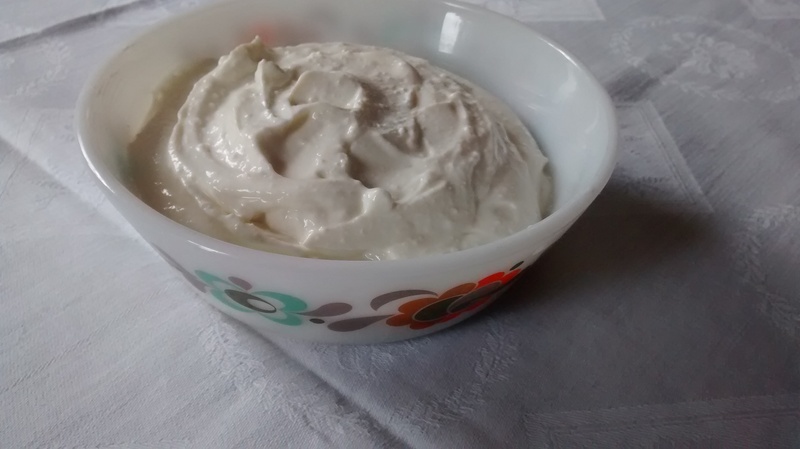 Recently I have been making my own yoghurt and yoghurt cheese. You have to use a live yoghurt starter with pasteurised milk. This is very similar to twaróg, not identical but very near. 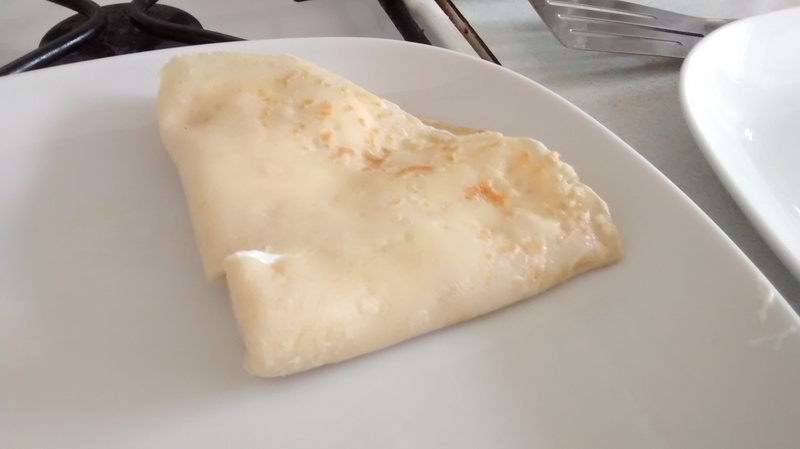 The result tastes wonderful but it takes a lot of time and effort to get enough cheese at home and so the following recipes use bought cheese. 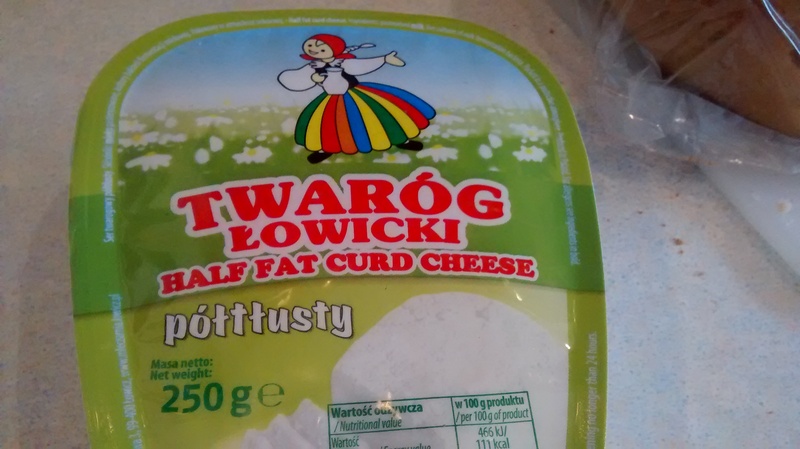 You can find twaróg now in Polish shops and some supermarkets and sometimes under its German name qwark. Previously as the curd cheese was not available my recipes have been adapted to use a Philadelphia ™ style cream cheese. Philadelphia ™ is a cream cheese invented in 1872 in New York State. Full fat makes the best cheesecake. You can use a mixture of full fat and medium fat but never use low fat cheese. 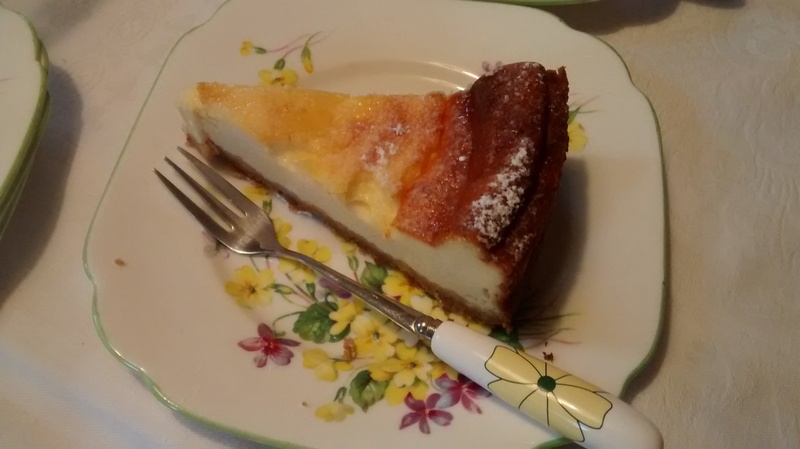 You cannot make a good baked cheesecake from low fat cheese. 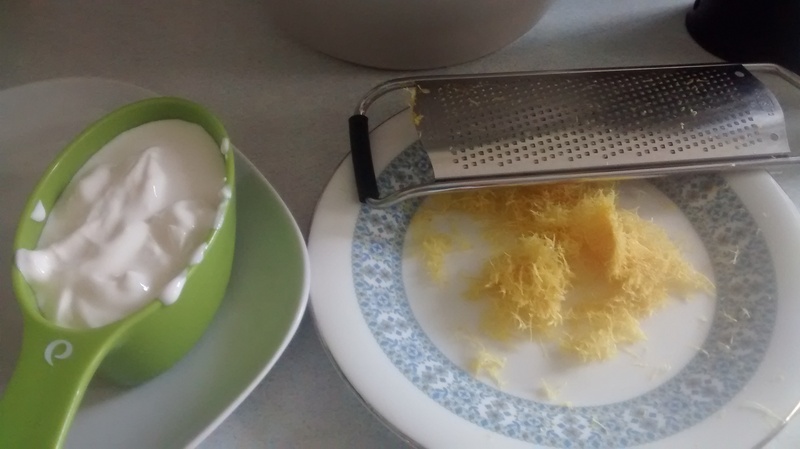 Curd cheese is slightly grainy and to get the best results you either need to put it through a mincer or use a blender. 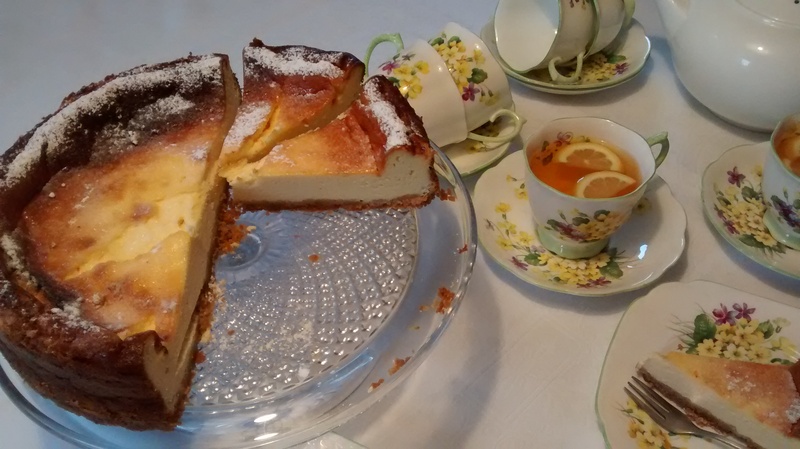 A traditional baked cheesecake has 2 layers – a cake base and then the curd cheese layer on top. In my mother’s original cake the cheese mixture was poured over a baked cake base but for ease I often use a crushed biscuit base. 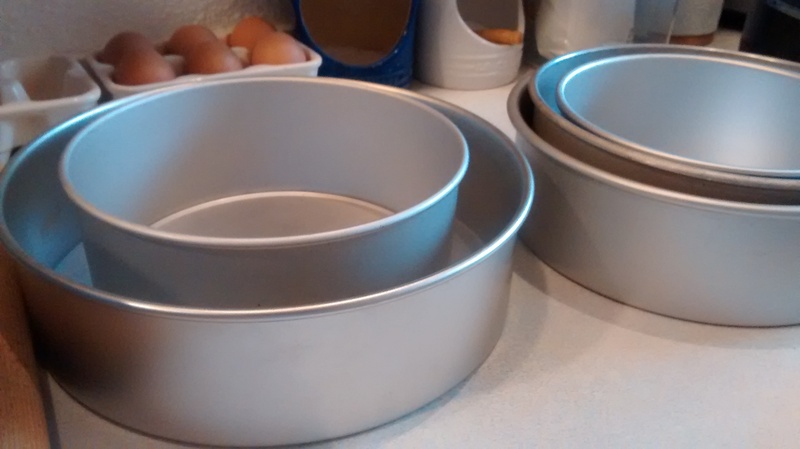 You need a round tin with a loose base or a spring form tin or you will not be able to get the cake out. I always use an anodised aluminium tin, 23cm in diameter and 7 cm deep, which does not rust. 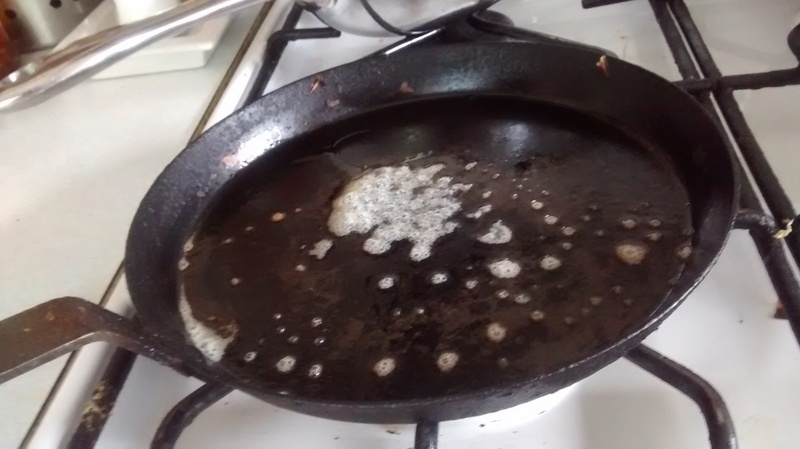 Grease the tin well with butter. Crush the biscuits to make fine crumbs and use some of these to coat the sides of the greased tin. Add the melted butter to the rest of the biscuits and mix together. Put this mixture onto the base of the tin pressing it down firmly. 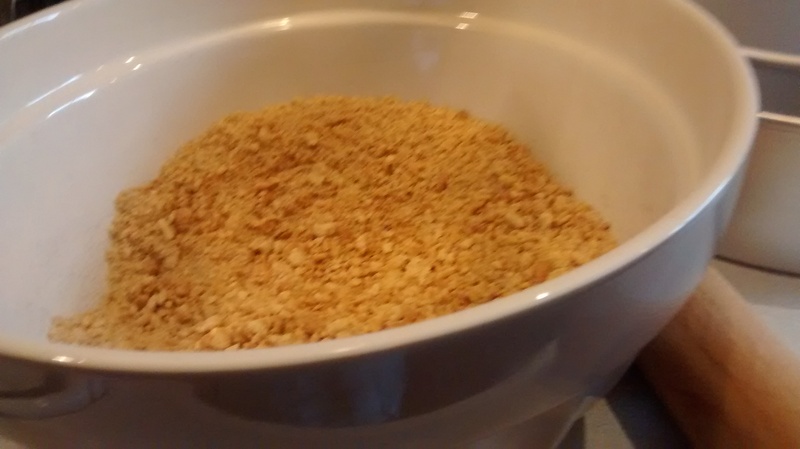 Leave the tin in a cold place whilst you make the cheese mixture. Pre heat the oven to GM4 – 180oC. In a large bowl beat the yolks and sugar until they are thick and creamy – the mixture should be lighter in colour than the original yolks and be creamy. (This may take around 5 minutes). Then add the cooled melted butter, cheese and vanilla essence. If using the semolina, add this now – it makes the cake a bit denser. 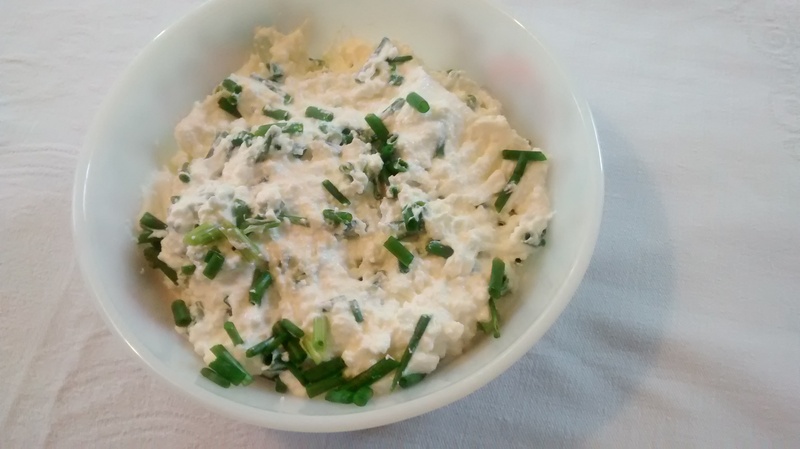 (I rarely add this with cream cheese, more often with curd cheese). 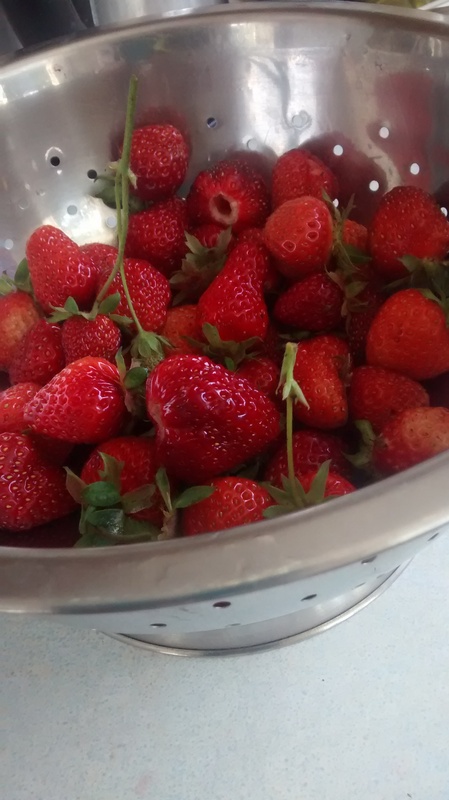 Beat the whites with a whisk until you have soft peaks and fold these into the mixture. 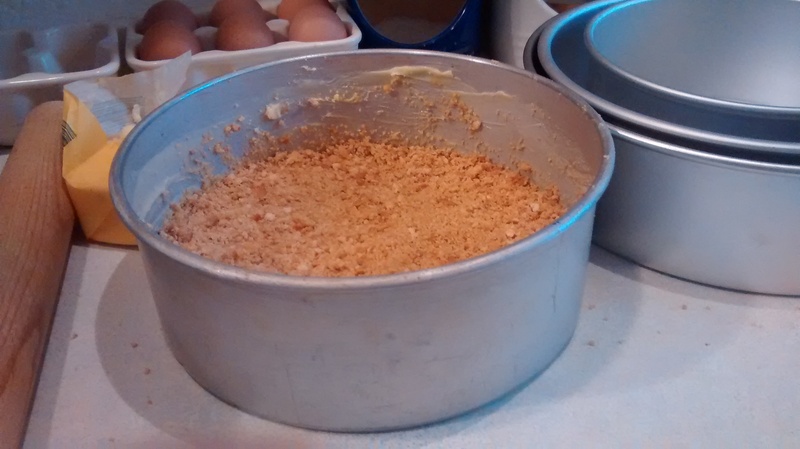 Pour the mixture on top of the biscuit base and bake for 1 to 1 ¼ hours. Check after an hour, if the top starts to get too brown before the cake is cooked place a piece of foil over the top. Once the cake is cooked switch off the oven, you can leave the door open slightly and let it cool down in the oven, this prevents it sagging and cracking too much as it cools. 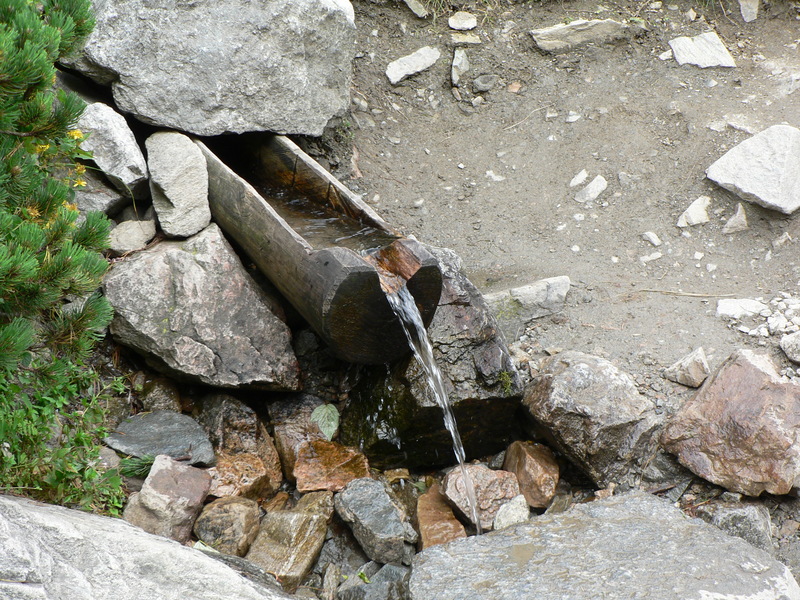 (It will sag and often does crack – this is not unusual). Once the cake is cool you can take it out of the tin. I use a tin can and put the cake tin on this and slide the side of the cake tin down. Dust the top of the cake with icing sugar before serving. This cake tastes best if allowed to get cold, so make it the day before it is needed. You can make endless variations on this basic recipe by adding raisins, mixed peel, fresh raspberries and so on or adding a drizzle of melted dark chocolate on the top when it has cooled. 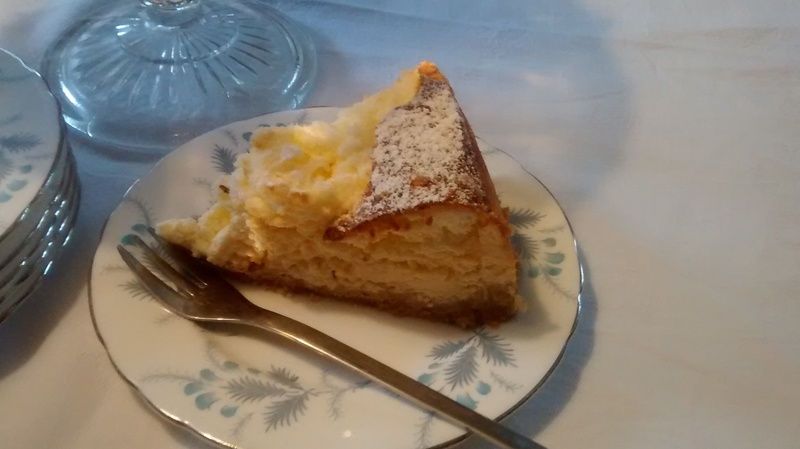 In Poland one type of cheesecake is described as Viennese and another as from Kraków. 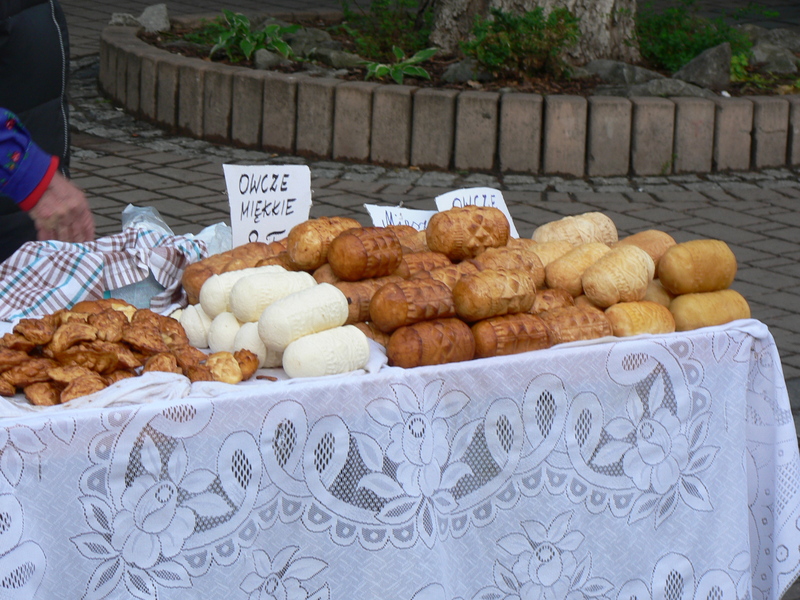 The Viennese one has sultanas or raisins and orange peel in the cheese mixture and sometimes some chocolate on top, whilst the one from Kraków is traditionally baked in a square or rectangular shape and has a lattice of pastry over the top and will also have sultanas or raisins in the cheese mixture. 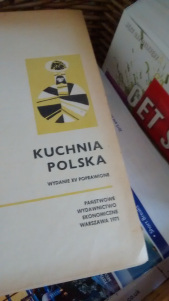 I cannot quite remember the origin of this version, I think my mother got it either from one of her friends or from the Polish newspaper. It has soured cream as one of the ingredients but no butter. 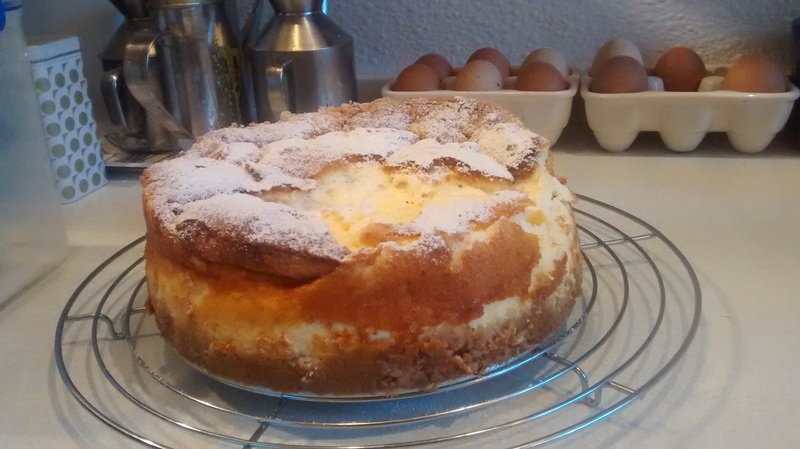 It uses all the egg whites which are stiffly beaten causing this cake to have a lighter texture and it rises more but does sink down again as it cools. In a large bowl beat the yolks and sugar until they are thick and creamy, add the lemon rind (or vanilla essence), soured cream and cheese. In another large bowl whisk the whites till they are stiff and fold these into the cheese mixture using a metal spoon. 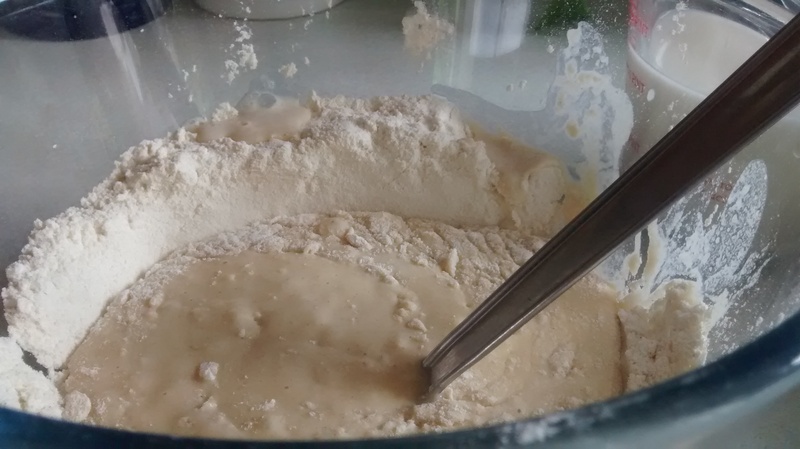 Pour the mixture on top of the biscuit base and bake for 50 minutes to 1 hour. Check after 50 minutes if the top starts to get too brown before the cake is cooked place a piece of foil over the top. Once the cake is cooked switch of the oven, you can leave the door open slightly and let it cool down in the oven, this prevents it sagging and cracking too much as it cools. I have tried this out as a just vegetable variation. 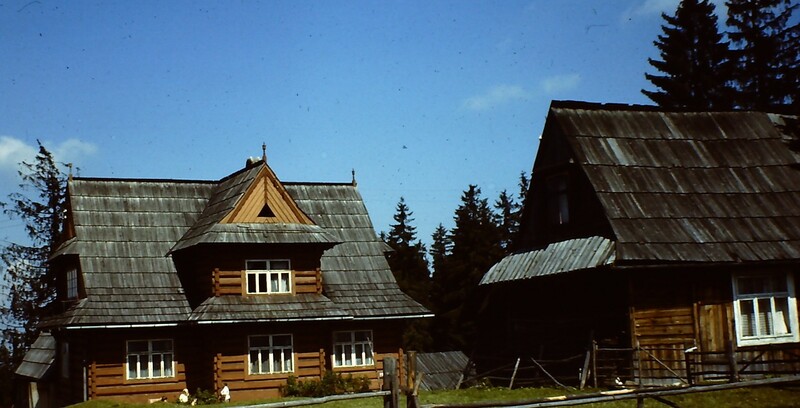 In my Polish cookbooks there are many variations without meat and they use mushrooms or other vegetables and grains, but these tend to use just dried mushrooms and often rather than rice use buckwheat or pearl barley. 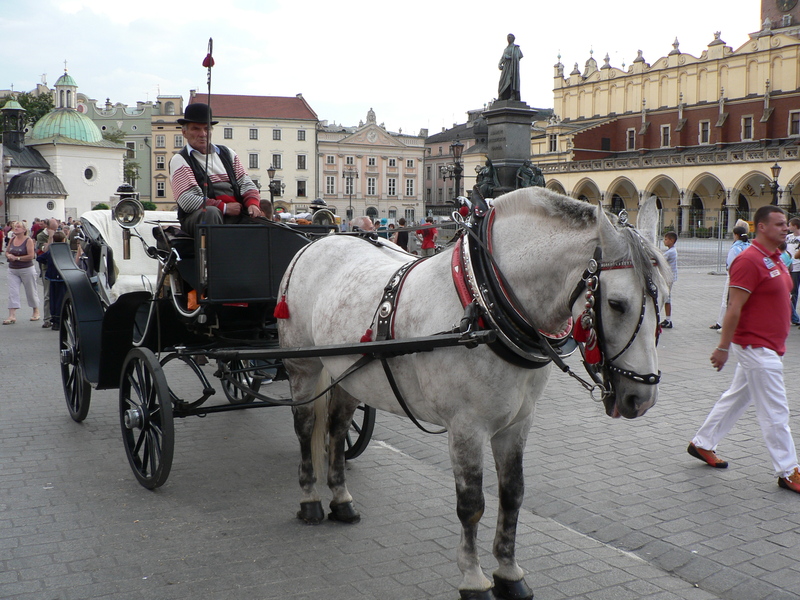 Whilst these grains are maybe more traditionally Polish in style I wanted to do a recipe which would initially be more appealing to the English taste. 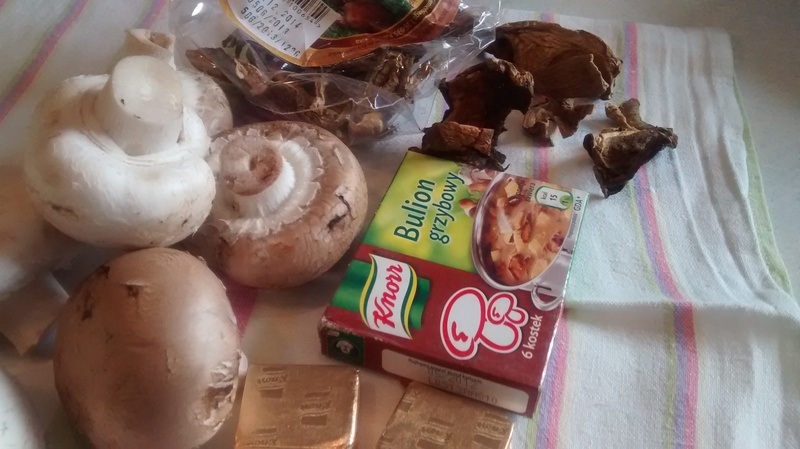 Also I wanted to use mainly fresh mushrooms. In a small bowl add the boiling water to the dried mushrooms , just enough to cover them, and leave overnight. Parboil the rice and leave to go cold. (You can use any already cooked rice you might have cooked already – it is not that critical – it will just have a softer texture). Finely Slice up the mushroom caps (You can chop them into smaller pieces) and fry them in the butter until they are soft. 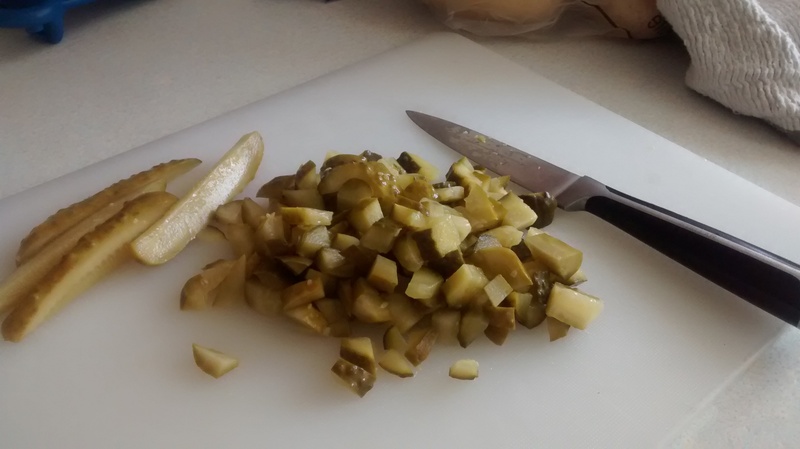 Using a knife make a pulp of the dried mushrooms or chop them into small pieces if they have not softened enough. 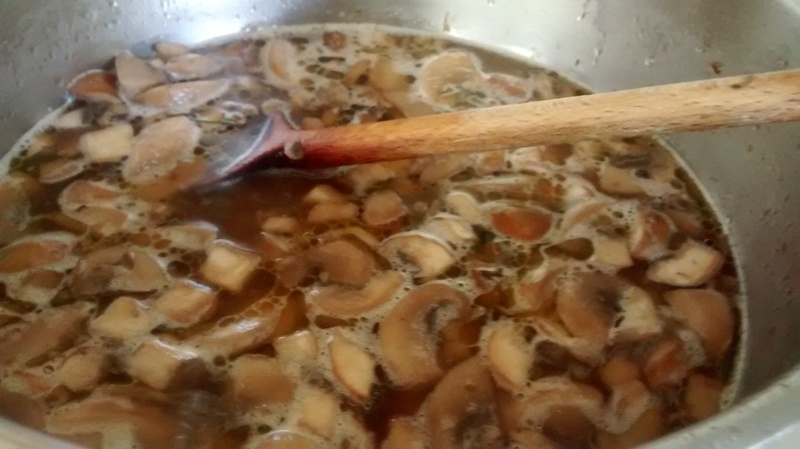 Add the mushroom pulp and the liquor in which they were steeped to the frying mushrooms and continue cooking the mixture evaporating of most of the liquid or about 10 minutes. Leave the mushrooms to cool. 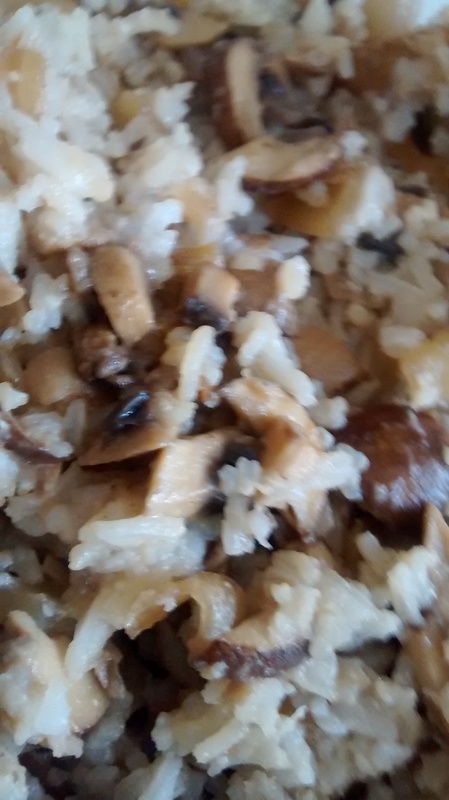 In a large bowl mix the parboiled rice and mushroom mix, add salt and pepper to taste. 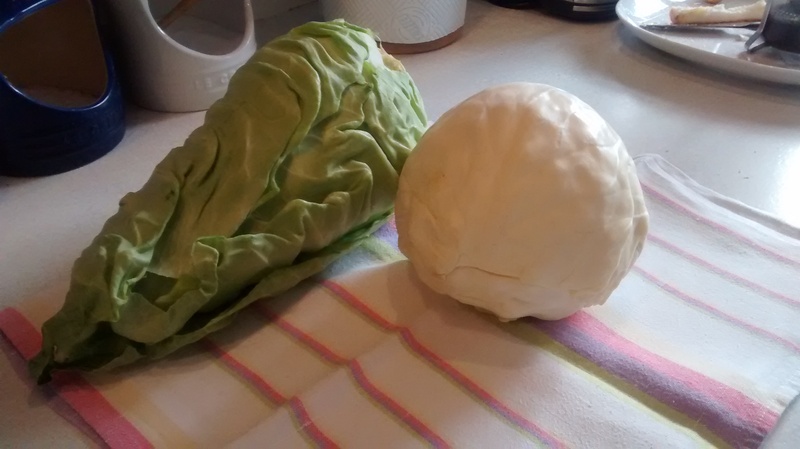 You need a large white cabbage or a savoy cabbage or I have now started using sweetheart cabbage – you might need 2 of these as they are not usually so large. Patience is called for here to avoid getting scalded fingers. 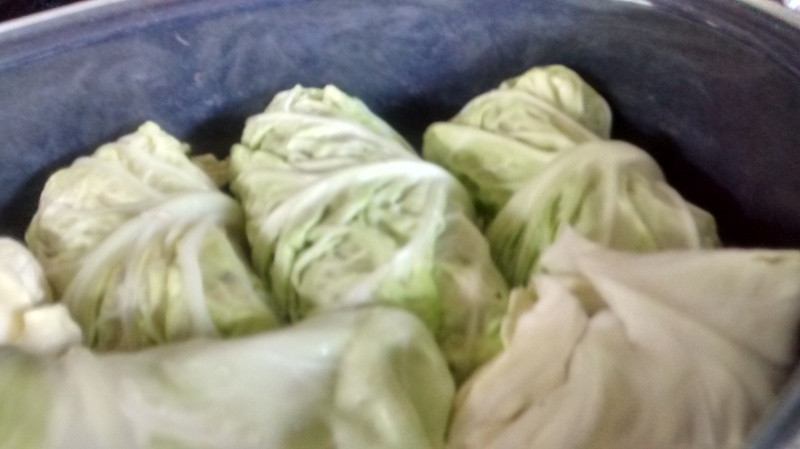 You have to heat or steam the cabbage to make the leaves pliable so you can remove them one by one and use them to encase the filling. 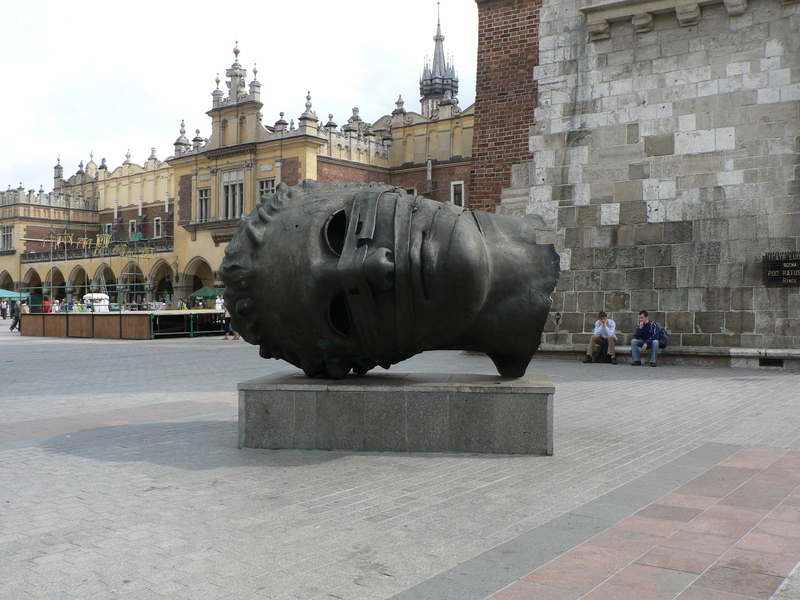 You need the largest pan you have into which you place the cabbage head. I boil some water in a kettle and pour this over the cabbage in the pan. With some heat under the pan I let the cabbage cook a little. The temptation is to boil too quickly so making some of the leave too soft and runs the risk of getting scalded as you try to remove the leaves. Another method is to place the cabbage into a metal colander and set this over the pan of water so that it is steamed rather than boiled – I think this method is the one I like best. 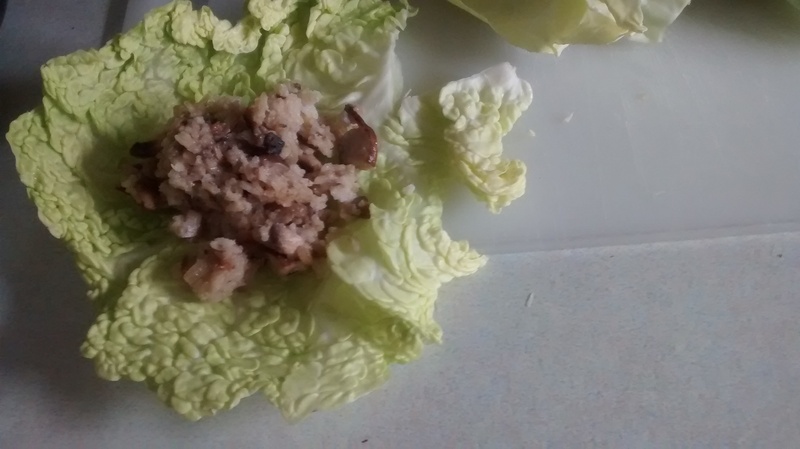 Fill the leaves with the rice & mushroom mix and roll them up from the stalk end, tuck in the sides and secure with the outer edge of the leaf to make a small parcel. Place the rolls into a large casserole dish, packing as many rolls as possible in rows in the dish. Depending on the depth of the dish repeat this for another layer. 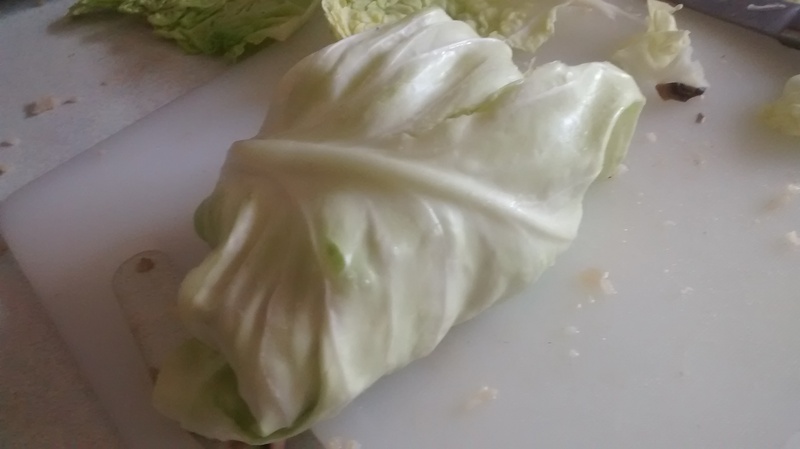 If you have any extra cabbage leaves place these on the base of the dish and then to put extra leaves on the top of the rolls. The rolls sometimes have a habit of getting slightly burnt on the top as they come out of the liquid and sometimes at the base if they have been in the oven a long time, these extra layers protect the rolls and can be discarded at the end. Make a vegetable stock and pour this over the cabbage rolls. 3 or 4 peppercorns or allspice or both. Mix up the stock powder in a jug with boiling water, add the tomato purée and then the rest of the ingredients. 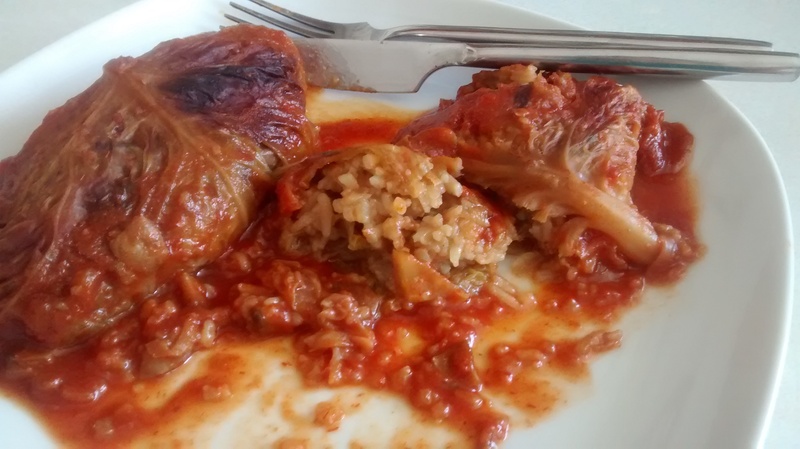 You need a large amount to cover the cabbage rolls. Cover the rolls with this liquid. It is a good idea to have extra which you can use to top up as they are cooking. Cover with a lid and place in the oven and cook for several hours. Check them occasionally and keep them covered with liquid as much as possible. As mentioned earlier I make these a day beforehand and then put them back in the oven for an hour or so before serving. 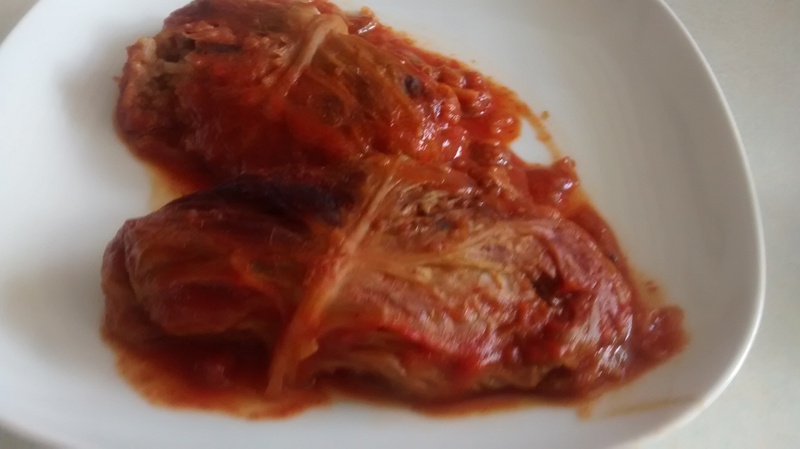 They are a complete meal in themselves but you can give serve them with some bread to mop up all the liquid sauce. I will be writing a post all about the special meal on this day later when all the dishes are meatless. This recipe is one dish which can be served then. 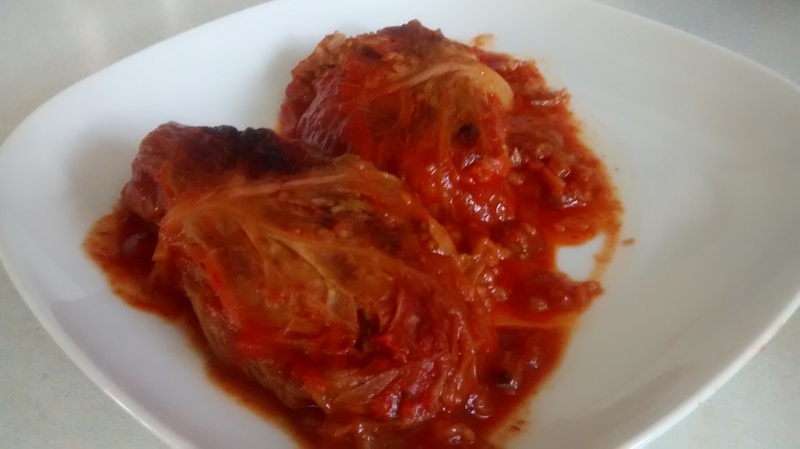 Cabbage Rolls in the style of Dom Polonii in Kraków. 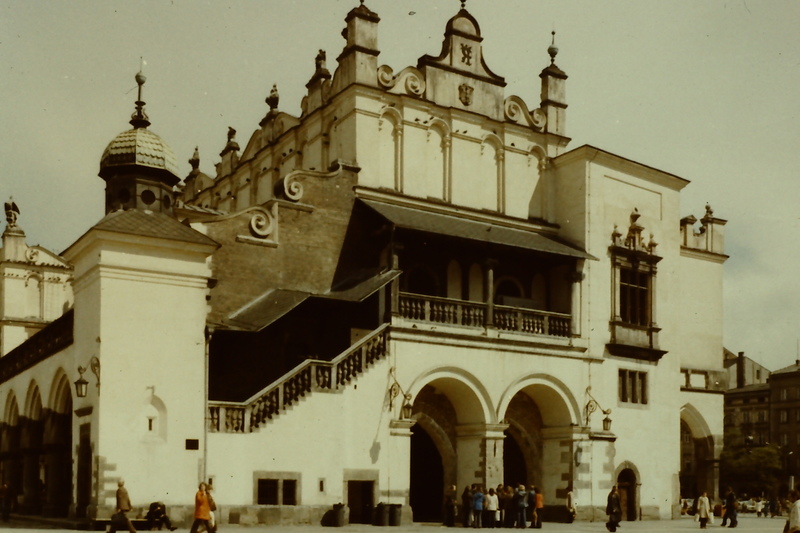 In Kraków, just off the main square (Rynek Główny), there is a building called Dom Polonii (The House of the Poles). 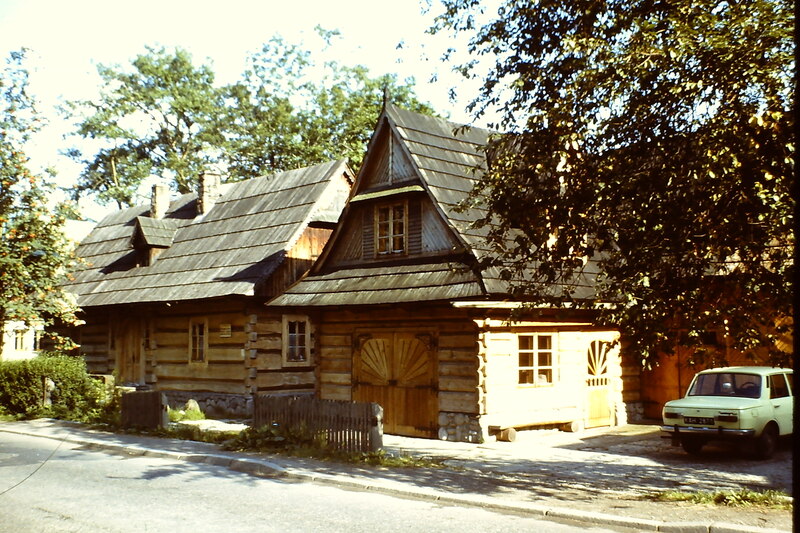 It is a medieval tenement building and hosts Chopin concerts in a lovely room with a grand piano on the first floor. I have enjoyed listening to many concerts there. 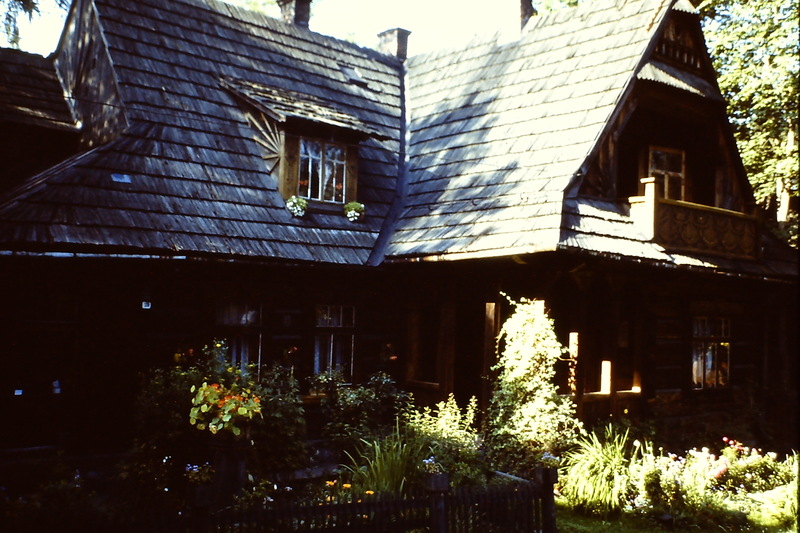 On the ground floor there is a small restaurant. 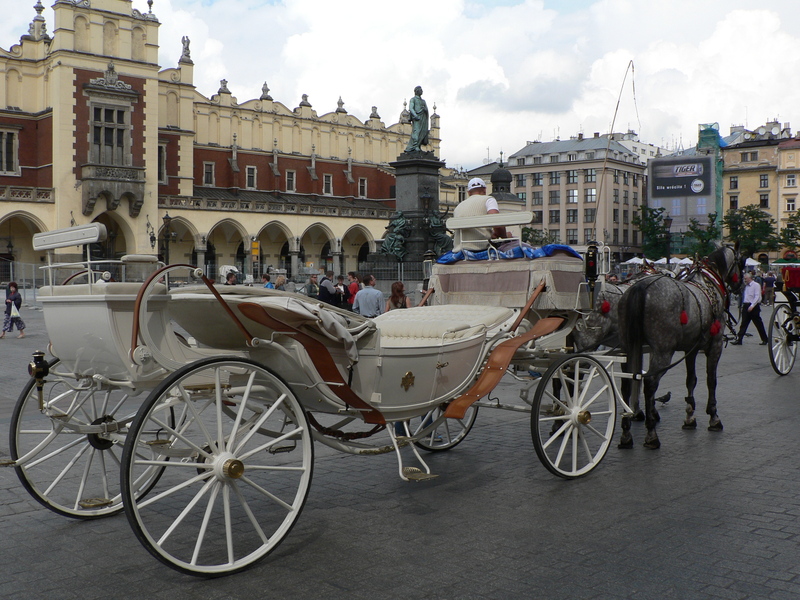 On my trips to Kraków I have found that I eat there the most as it is very reasonably priced and the food is very much like home cooking. 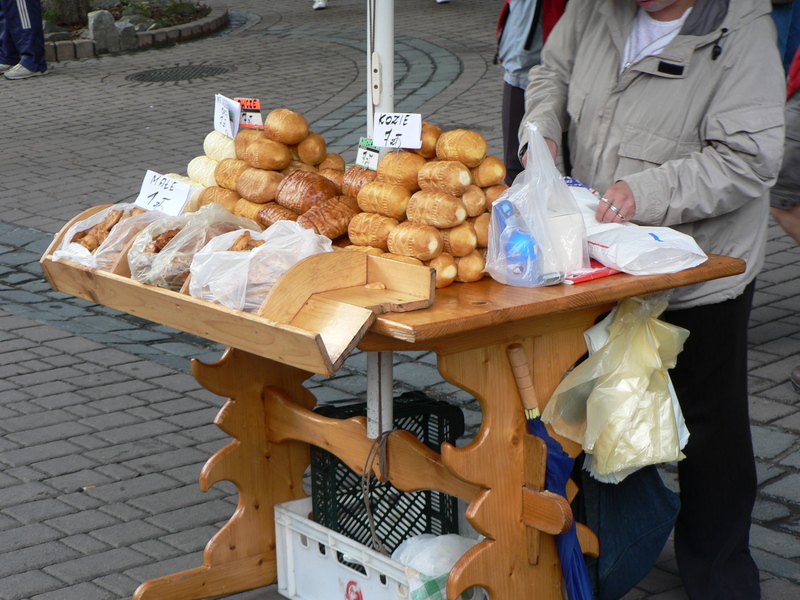 They serve gołąbki there which are cooked without tomatoes and then served with a creamy mushroom sauce. The following is my recreation of this recipe. 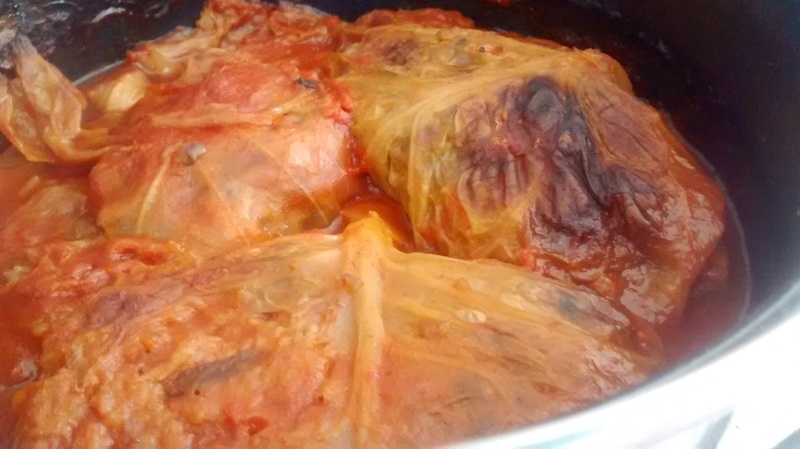 First I made the gołąbki as in my previous post but without tomato purée in the cooking stock but adding some lemon juice as this prevents the leaves from falling apart too quickly. I will give a quick re-cap of this recipe at the end of this post. 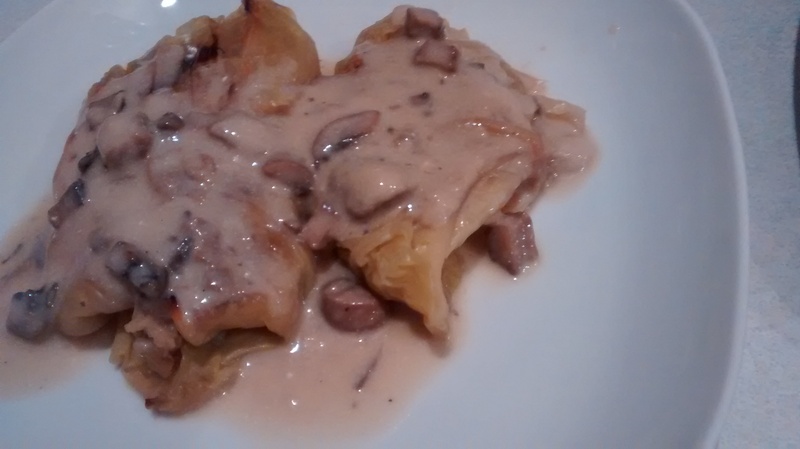 Then I made a mushroom sauce and served the gołąbki with this poured on the top. 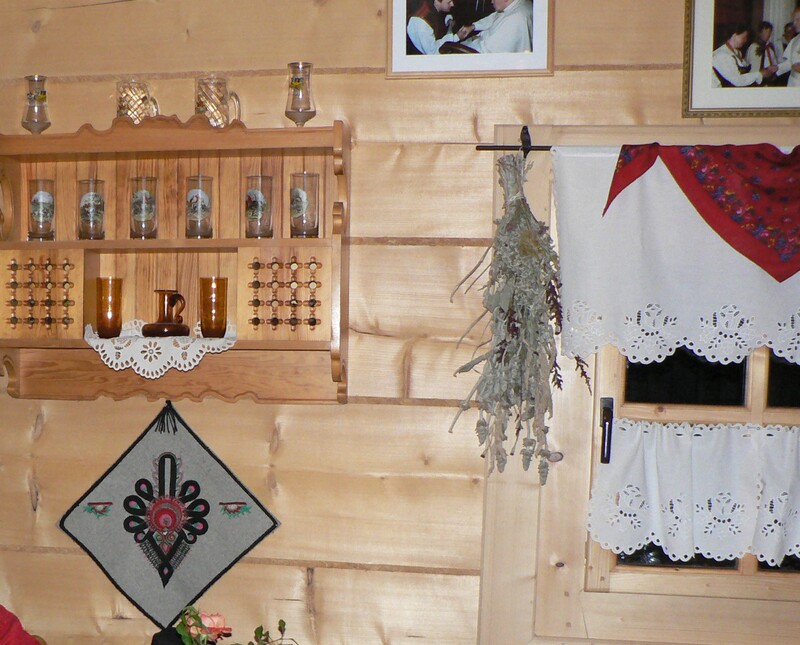 I looked through my Polish cookbooks and many of the mushroom sauces are made with just dried mushrooms. These are delicious and have a strong flavour however it works out very expensive and are not available everywhere. 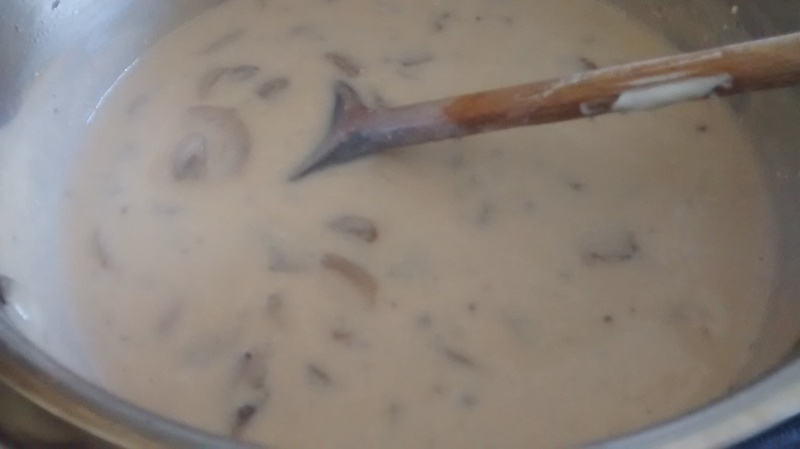 I am going to give instructions for a sauce using fresh mushroom and just a small amount of dried mushroom. 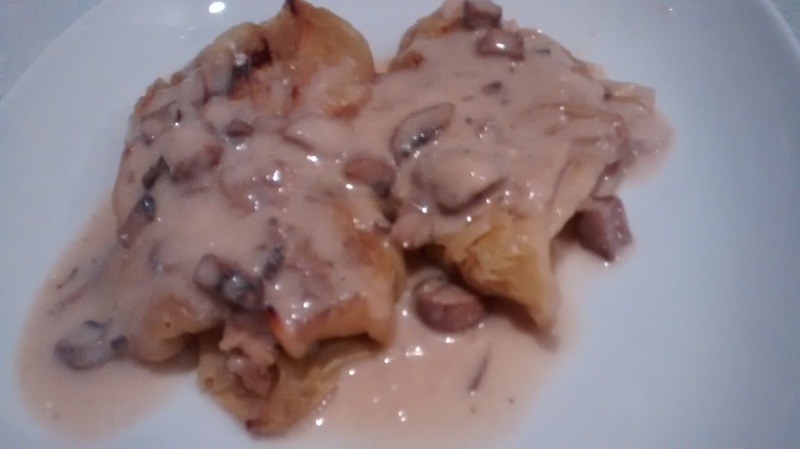 I will give 2 versions of this mushroom sauce, the first using dried mushrooms, the second a mushroom stock cube. 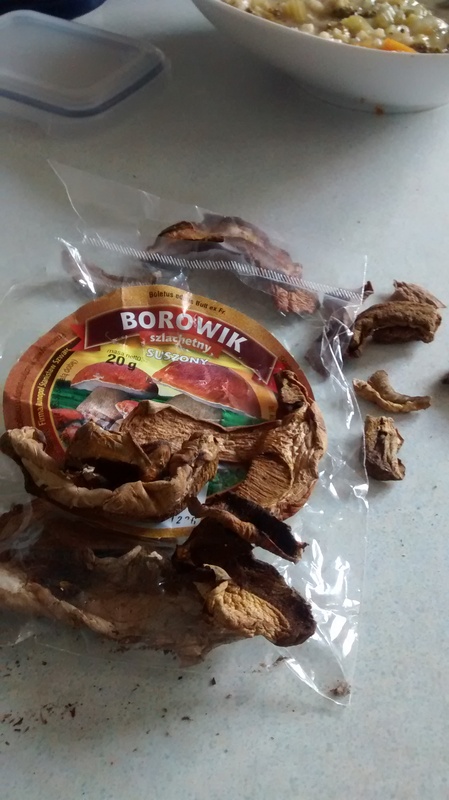 The best dried mushrooms are Boletus edulis, in Poland they are called borowik or prawdzik, in Italy porcini. 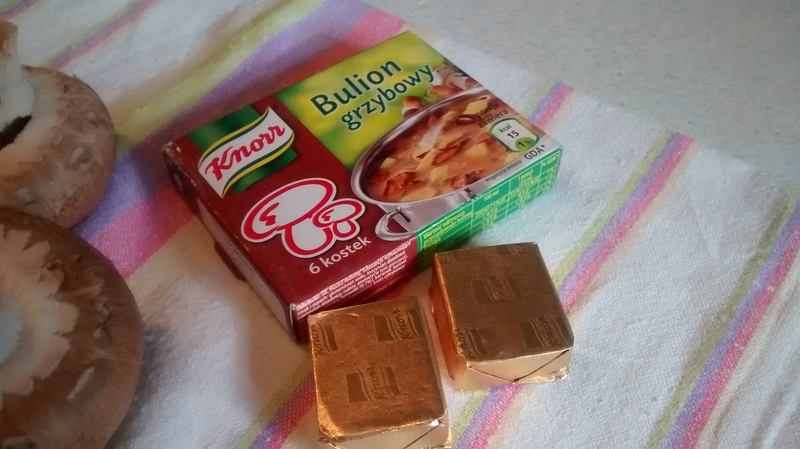 In Poland there are now mushroom stock cubes which are very useful especially for making sauces. Years ago I brought loads back to England, now you can find these in the many Polish food shops. 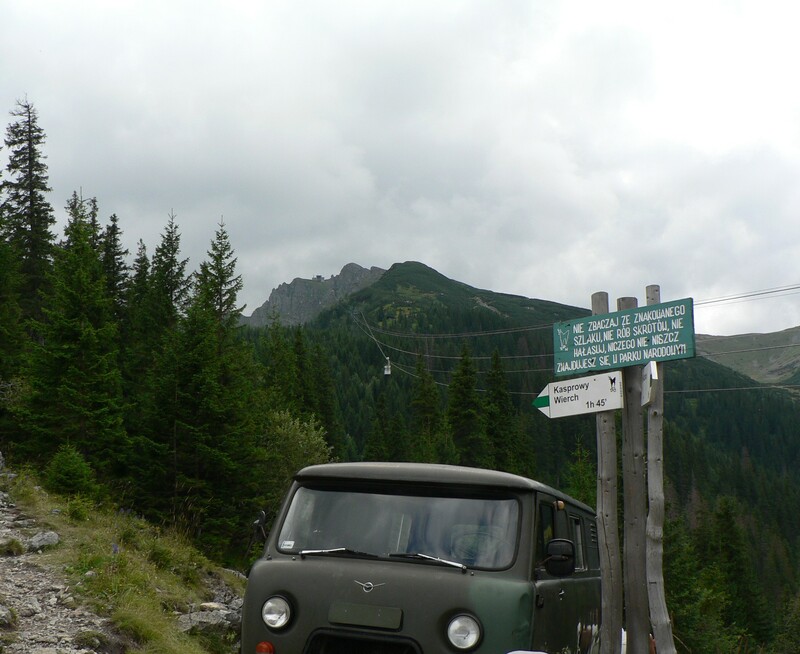 The ones I use are made by Knorr and are shown on the photographs in this post. 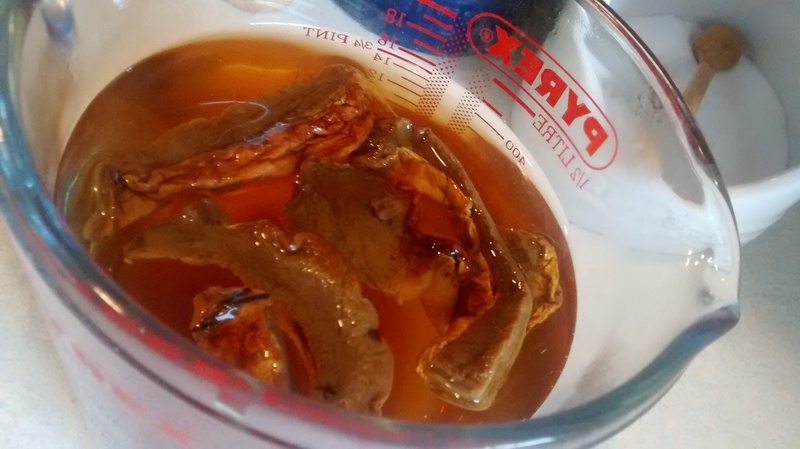 These stock cubes contain a small amount of dried mushroom extract. The 2 sauces have the same starting points it is the addition of reconstituted mushrooms or stock cubes for the extra taste which is the difference. 2 large tablespoons of soured cream. You have to start this sauce the night before or in the morning for use in the evening. 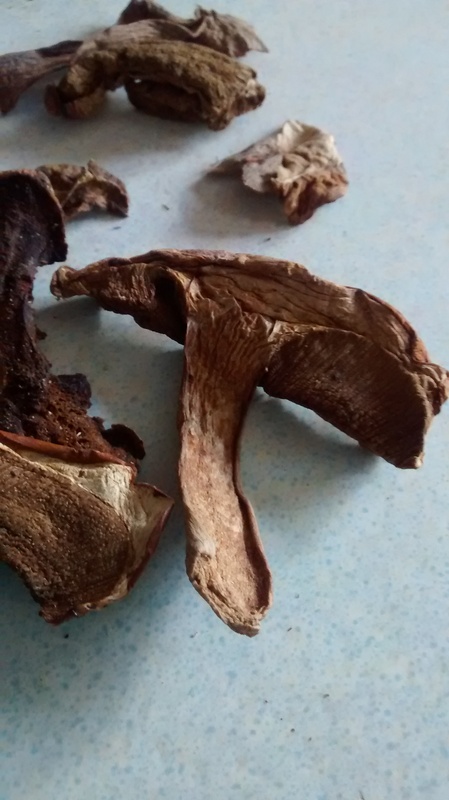 Cover the dried mushrooms with 500ml of boiling water and leave to soak. 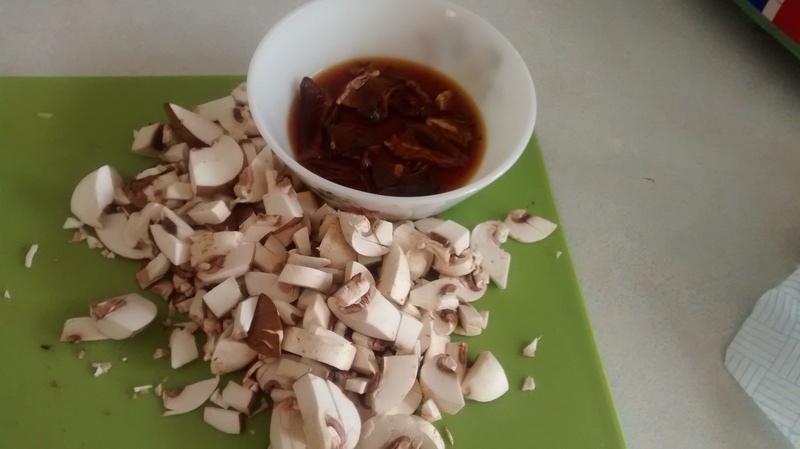 The following day take out the reconstituted mushrooms and using a knife you can chop then up into tiny pieces or if the are soft enough you can spread out the pulp on a chopping board. 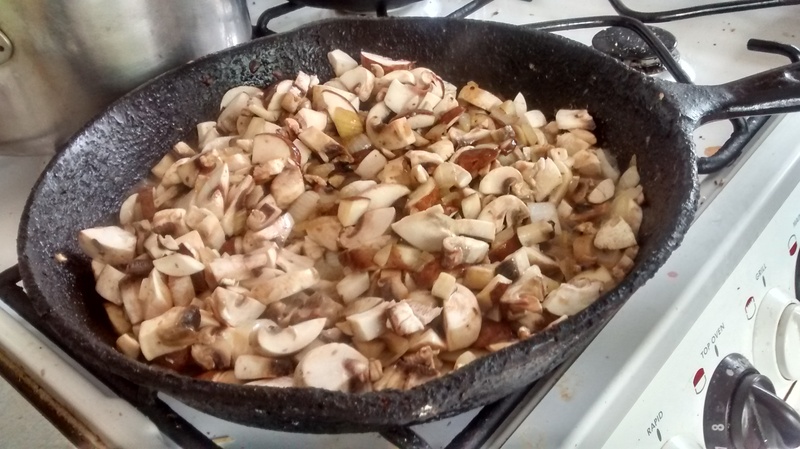 Slice the mushroom caps into fine slices and fry them gently in some butter till they are soft. 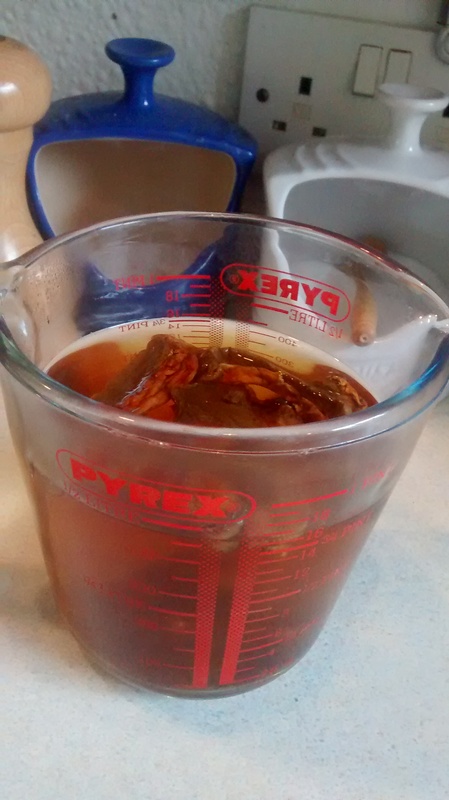 Add the dried mushroom pulp and the liquor in which they were seeped. Simmer gently for about 5 to 10 minutes. 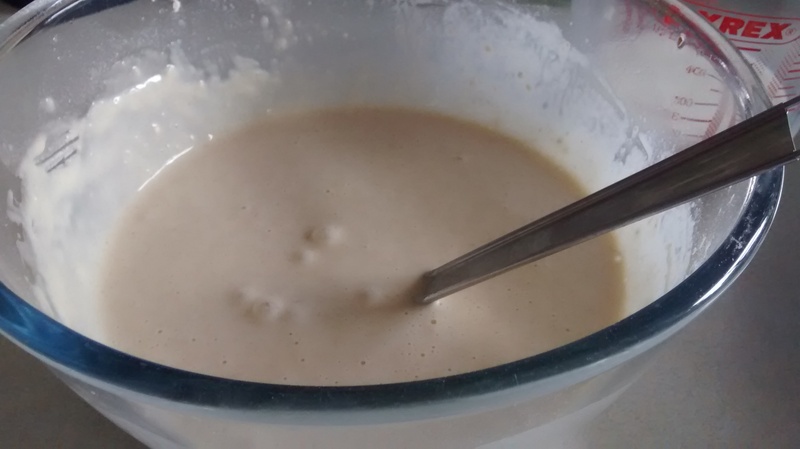 In a little dish mix the cornflour with the milk. Add the cornflour mixture to the cooked mushrooms and stir gently over the heat until the sauce thickens. Remove from the heat and add the 2 large spoonfuls of soured cream and mix well in. None of these amounts are exact – they are a rough guide depending on what you have – you can use more water, milk or soured cream and so on. butter to cook the mushrooms in. I rarely have to add any more salt or pepper as the stock cube has enough seasoning in it. 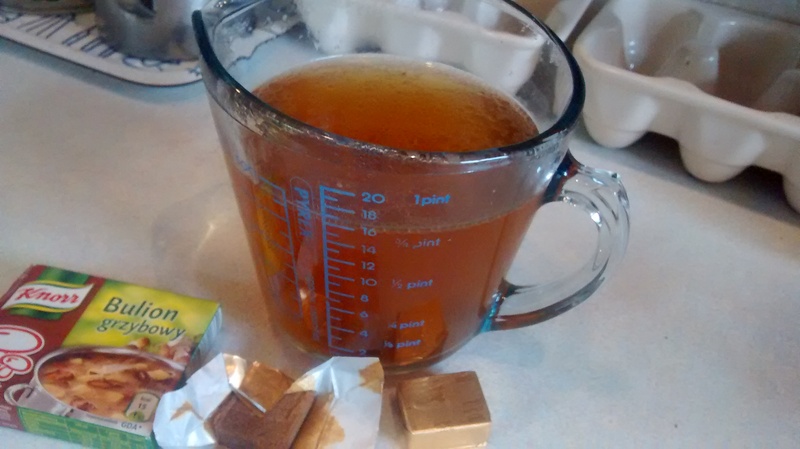 Dissolve the stock cube in the hot water. If you can get the stock cubes then version 2 is the quickest. juice of 1 or 2 lemons. 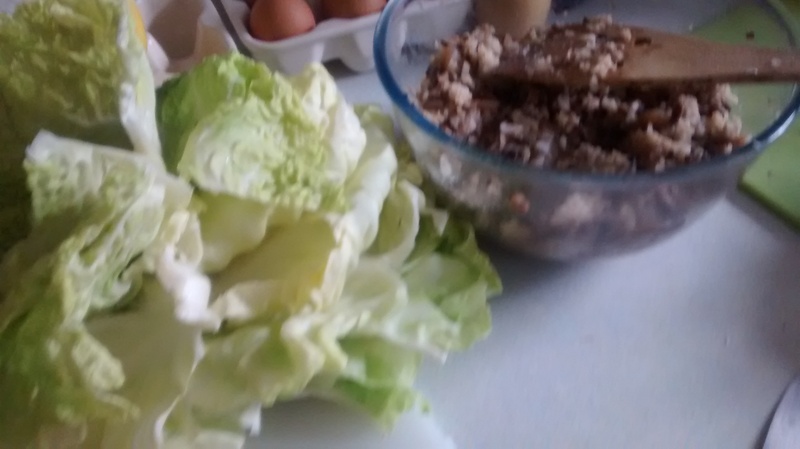 *As you need whole largish cabbage leaves I sometimes use 2 cabbages to get the bigger leaves. Recently I have started to use Sweetheart cabbage which has large leaves on the outside but you will most likely need 2 of these. You need to parboil the rice in salted water so that it is about half way to being cooked and then strain the rice and let it go cold, but if you have some plain boiled rice left from another day you could use this, as this is not critical. In a large bowl mix the rice and minced meat and add salt and pepper. The exact amounts do not matter. I like it to look about 50/50 white and pink but these can be made with much more rice to eke out the meat available. 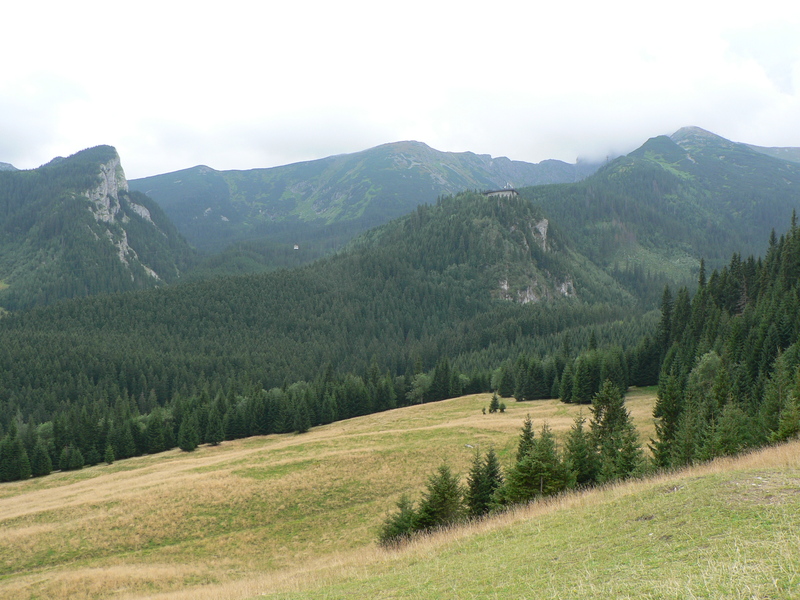 Next comes the hardest part and patience is called for here to avoid getting scalded fingers. You have to heat or steam the cabbage to make the leaves pliable so you can remove them one by one and use them to encase the filling. You need the largest pan you have into which you place the cabbage head. I boil some water in a kettle and pour this over the cabbage in the pan with some heat under the pan I let the cabbage cook a little. The temptation is to boil to quickly so making some of the leave too soft and runs the risk of getting scalded as you try to remove the leaves. 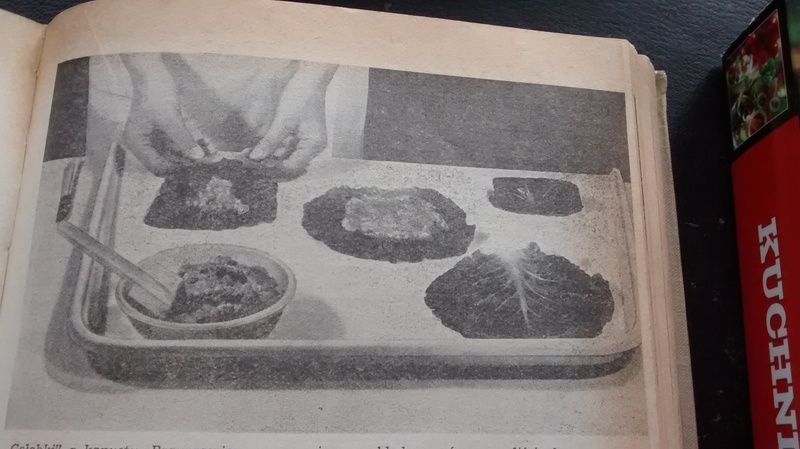 Another method is to place the cabbage into a metal colander and set this over the pan of water so that it is steamed rather than boiled. 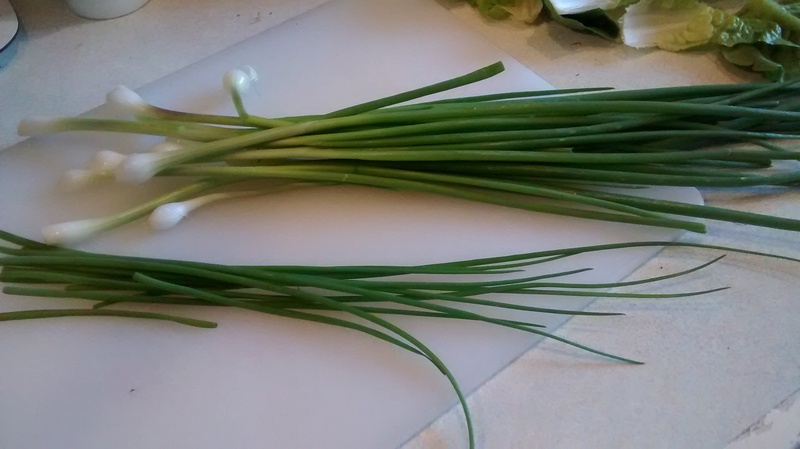 As the leaves become soft, you have to cut them off from the stalk and stack them up for to use later, you can cut out the thickest part of the stalk from the first few larger leaves. 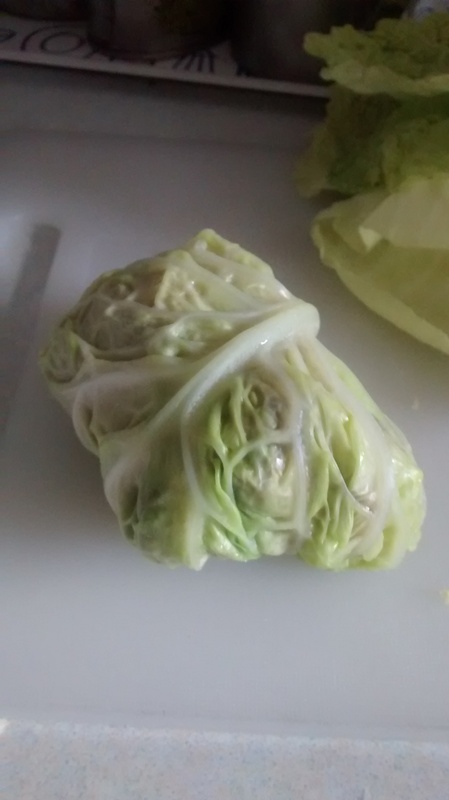 Place a small handful of the rice & meat mixture onto a cabbage leaf and roll up from the stalk end, tuck in the sides and secure with the outer edge of the leaf to make a small parcel. 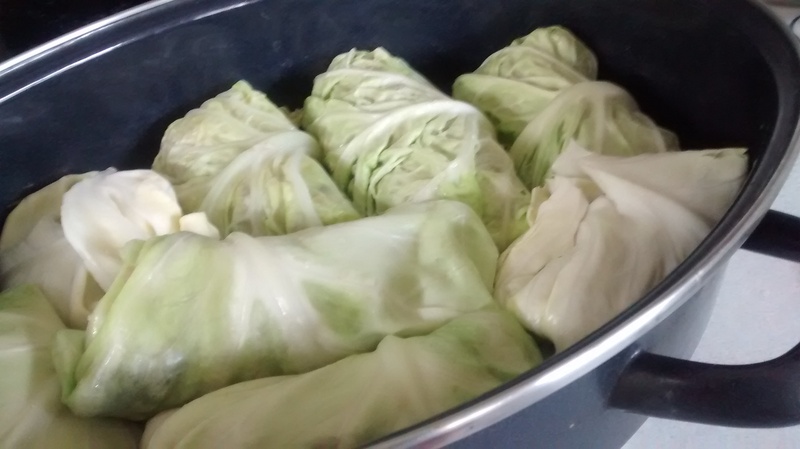 A tip I got from my late cousin, Krystyna, is to use extra cabbage leaves on the base of the dish and then to put extra leaves on the top of the rolls. Make a large amount of stock with hot water and lemon juice and add bay leaves, peppercorns and allspice. Cover with the lid and place in the oven and cook for several hours. Check them occasionally and keep them covered with liquid as much as possible. I always think these taste better when made a day before hand and left for the liquid to seep in more and then reheated in the oven as required. Sprinkling some chopped dill or flat leaf parsley on the top will be even better (Sadly I did not have any on the day of this photograph).